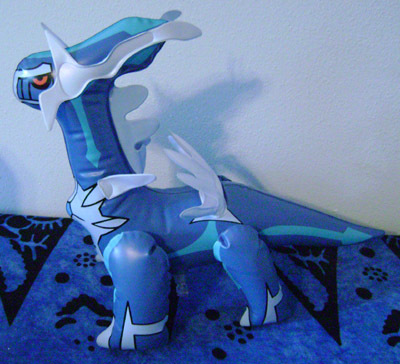 Things that weren't figures, plush, flat, or anything else easily describable...just Dialga! Pins, a subcollection of mine! This pin is covered with an awesome enamel design! 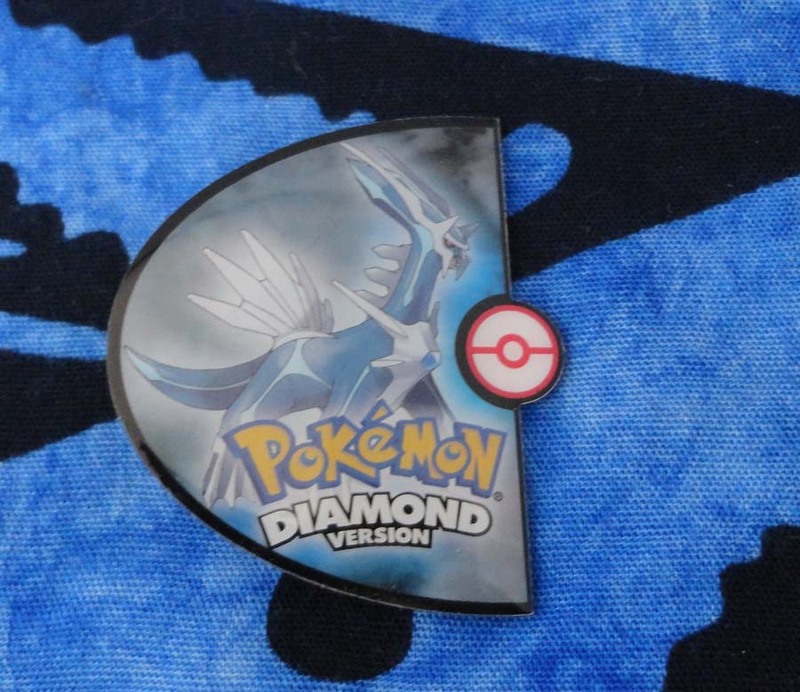 It seems to be a promotional item for the Japanese release of Pokemon Diamond; maybe a pre-order bonus? In any case, it's a great addition to my Diamond collection. 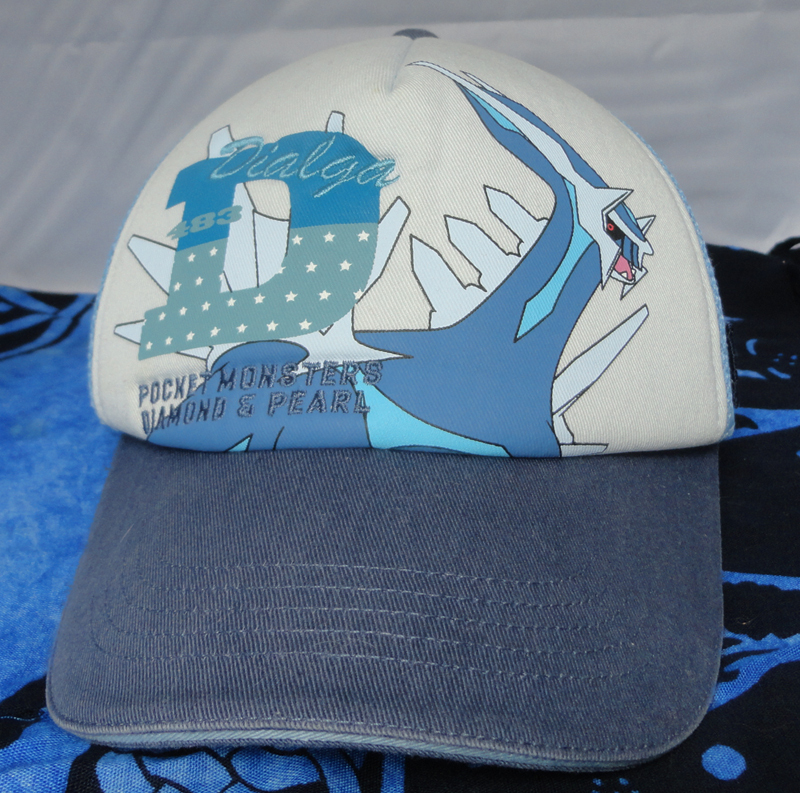 I've actually had this one for some time, but kept forgetting to upload it as it was with a bunch of older items ^_^; This came as part of a pair with a Pearl Palkia badge. 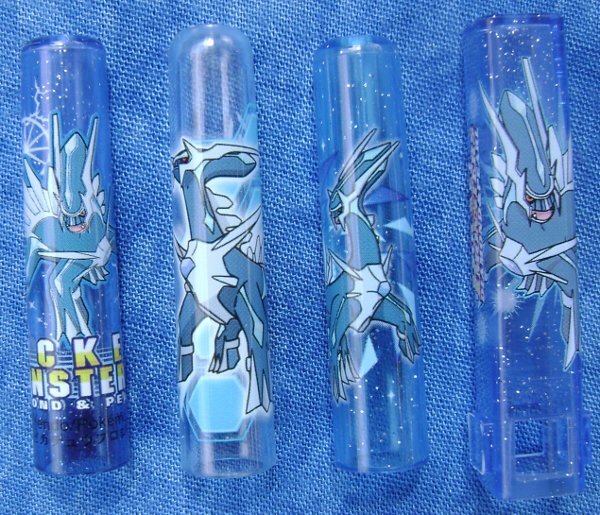 I think these may be one of my oldest Dialga items, because it looks like they may have been promotional items for Diamond and Pearl's Japanese release. 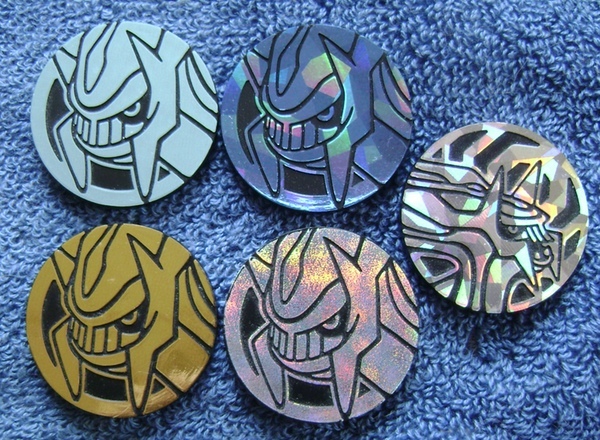 Oh, these badges. 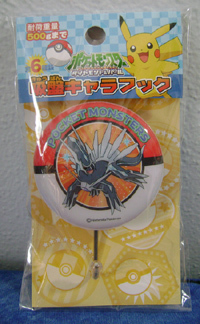 Each is one of 6 badges that was only available in bags of cookies sold at the Pokemon Center. I ended up buying 10 bags of almond cookies, and finally getting the 2008 badge on the 8th. But it's so beautiful that I can have no complaints!! The newer one on the right was not quite so finicky, and I only had to buy 2 bags of chocolate chip cookies to get him. I wasn't actually aware these nifty pins existed until Gin (the owner of Sunyshore) found them and sold them to me. How aweseome! One of them had a card, which is this one. On my second trip, this badge was the finicky one - I bought over a dozen of the randomly packaged badges and didn't get it. 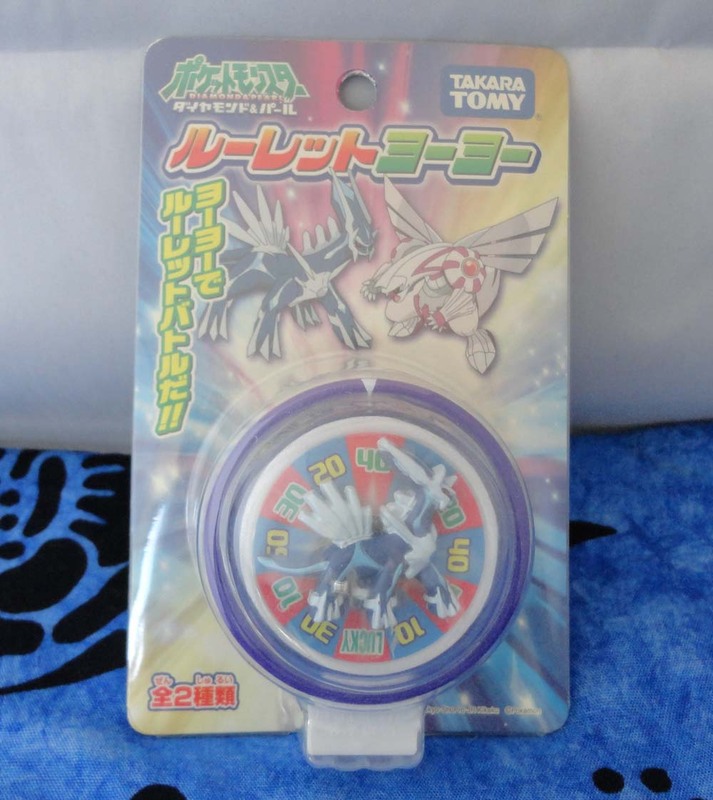 Since they'd just recently come out, I could only find them at the Pokemon Center, and I was starting to worry I wouldn't get one before I left. But thankfully, I got him on my last trip there! 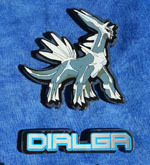 From the set just before the Shaymin/Giratina set, we have a shiny new Dialga can badge! Yay! In addition to the two other can badge sets this summer (see the above), they also released a set of large movie can badges featuring Pokemon from the movie performing attacks. 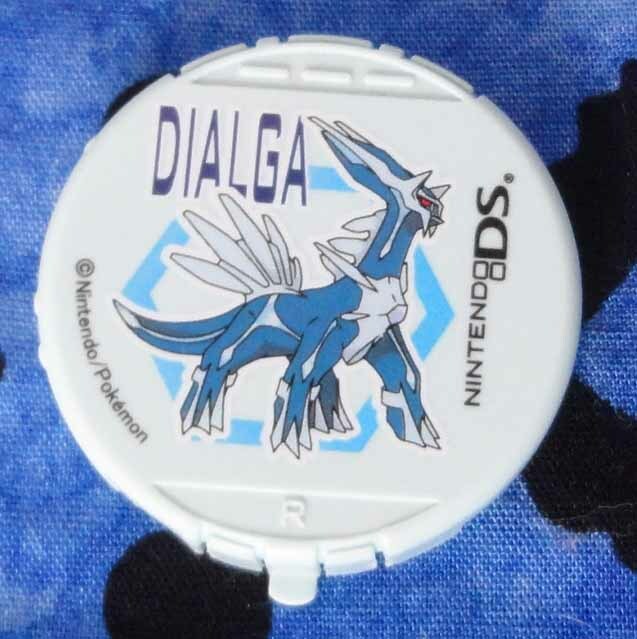 I was pleased to nab the Dialga! 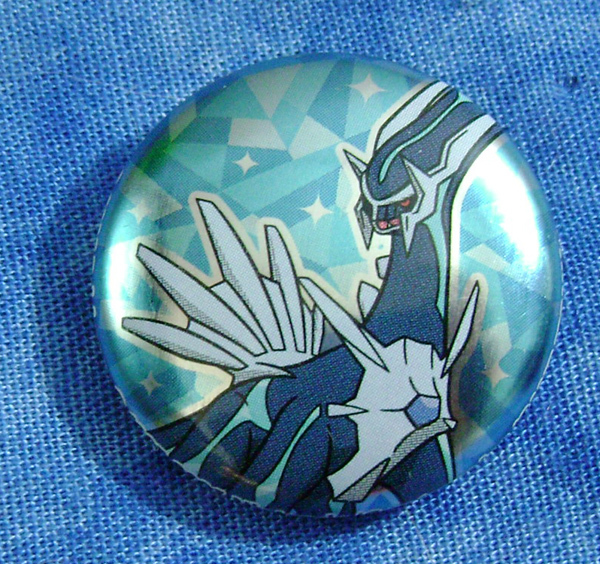 I flipped out when I saw this badge in a sales post on pkmncollectors, because I'd never seen it before and certainly didn't have it! Since she received it in a random lot of items, pheonixxfoxx didn't know where it was from either. I thought at first it was a can badge I'd somehow missed, but on comparing it with my other can badges, it's a bit different - the surface is rounded instead of flat, and the text at the bottom is different. 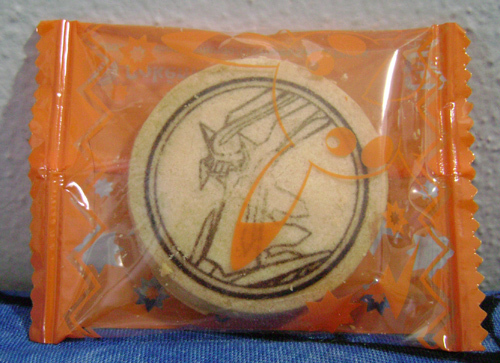 It's most like the cookie bag can badges, so I think perhaps it's from some candy or cookie set in 2007 that I've never seen. Whatever it is though, it's quite pretty and I'm happy to have it! 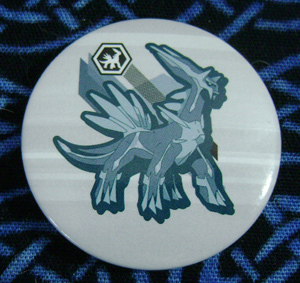 A badge with an interesting design, dated 2007. 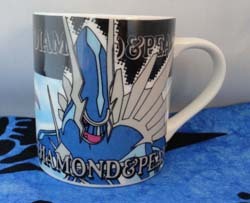 This was one of many items rentorar found in stores for me in the UK. Thanks for helping my collection out so much! 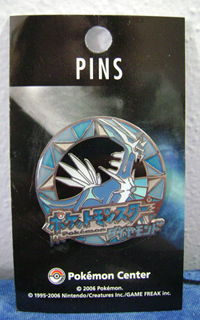 This pin (along with its counterpart featuring the D/P starters) were part of the package for the Pokemon Center Limited Edition Dialga/Palkia DS. You can see it still in its packaging here. This was actually one of the first few Dialga items I picked up, maybe because it was easy to get on eBay at the time. A mysterious item we don't know the origins of! We thought at first it might be custom, but I've seen other Pokemon (like Bonsly) with this same type of badge, and the back doesn't look like most fan-made badges I've seen. If you have any information about these, please let me know! Stamps! Another subcollection of mine. From two nifty stamp sets featuring other legendary and movie Pokemon. Neat! 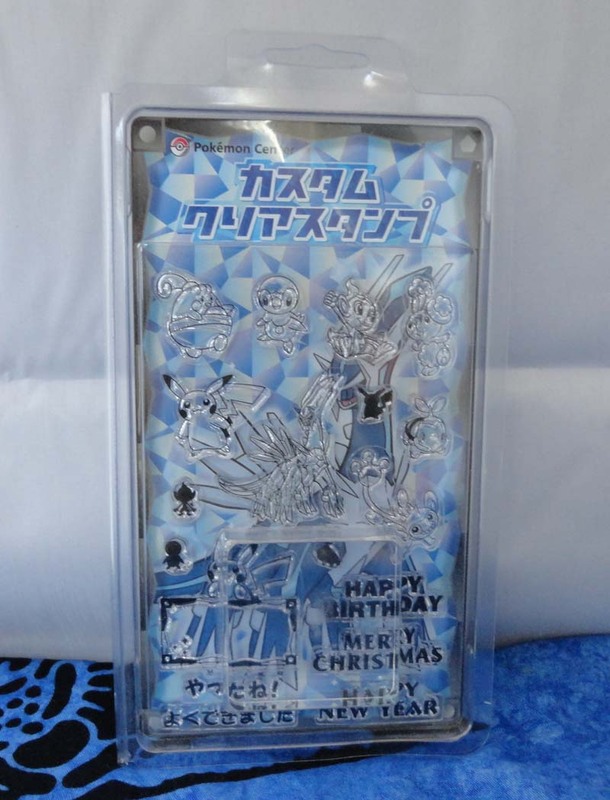 This isn't custom in the usual pkmncollectors sense (meaning handmade), but is instead a kit that you can use to stamp things with Pokemon and phrases as you wish. 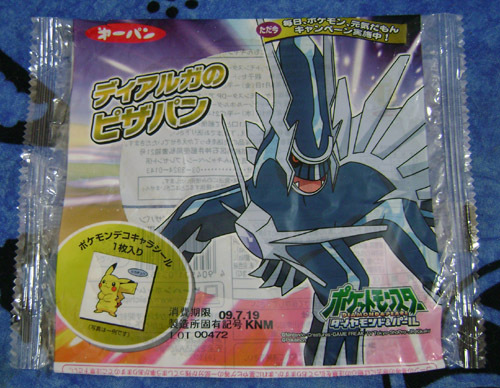 I'm keeping it in the packaging though, because the huge Dialga backing and all the diamonds make it a very Dialga-centric item! 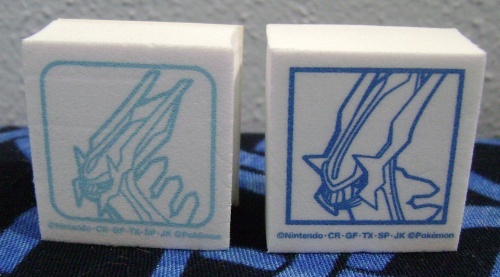 Pokemon Retsuden Stamp Series: From front to back, left to right. As far as I know, this is now a complete collection! This was probably the first Dialga stamp to join my collection. Good thing too, since it seems pretty rare! 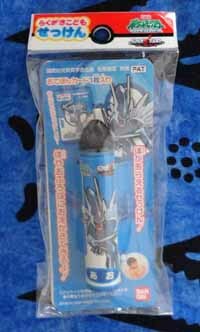 I was searching for stamps one day and found a sealed box of Retsuden series 2, which is fairly old as far as DP toys go. 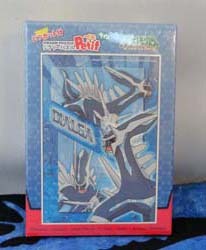 I then saw Dialga on the box and wow, it was one I didn't have and didn't know about. 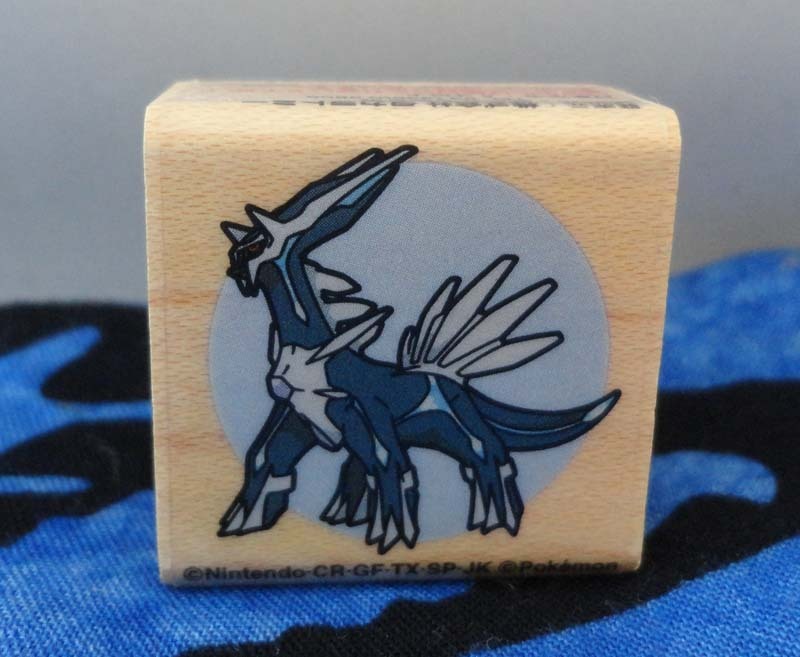 I bought the box and lucked out, getting Dialga and a number of other nice stamps! This was the last of these in my search. 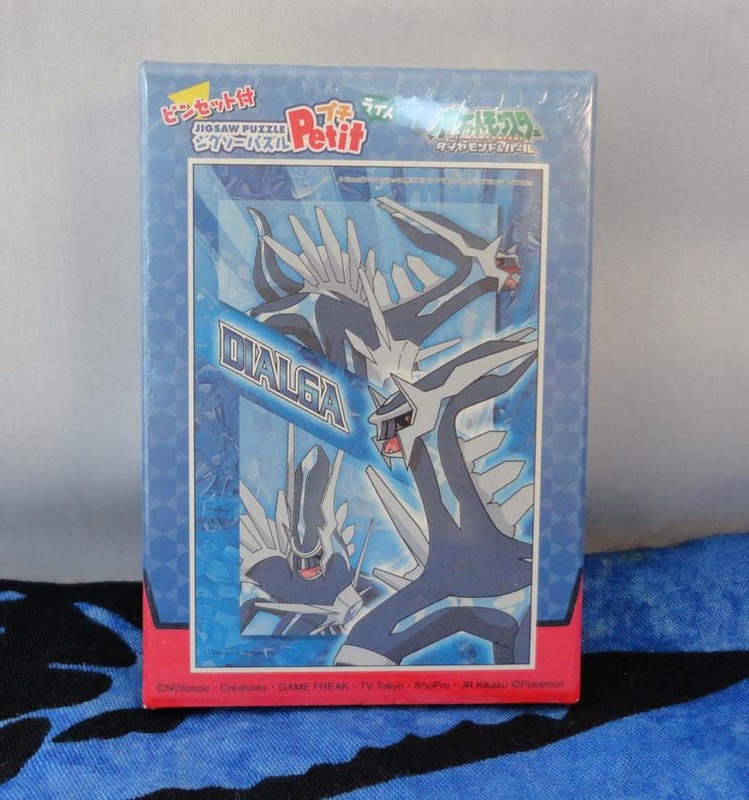 DP3 is an extremely rare set, and I'd checked the stamp auctions often without seeing many from it, but eventually a box appeared, was won by kylie_fanatic, the Dialga was sold to me, and my set was completed! Unfortunately, he broke during shipping, so I'd still like to get another...but for now, the collection is complete! 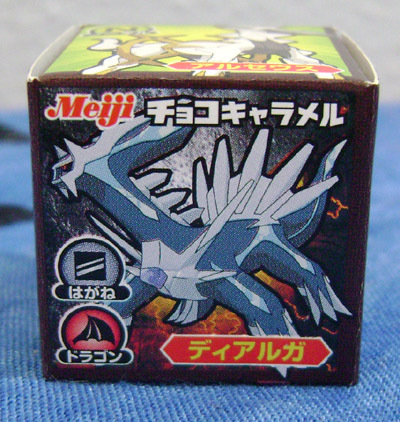 After buying 30 or so of these randomly packaged stamps in Japan, and still not getting Dialga, I turned to Yahoo Japan. This stamp wasn't listed there (at least not under Dialga), so I bought a full sealed box of the set to try my luck. And lo, there he was! 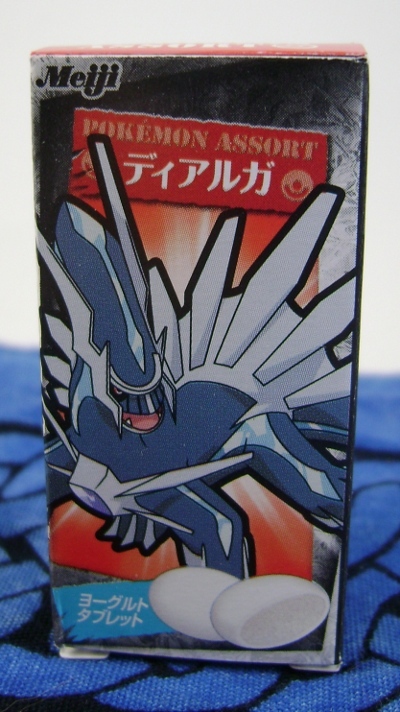 Gin of Sunyshore bought a few stamps from this series (to get the Staraptor, I think) and ended up with the Dialga. I was very relieved to be able to buy it directly from her and not have to go through the same trouble as with the Series 4 stamp! This set has a lot of popular Pokemon like Suicune and Leafeon, so Gin bought a large amount of them and took claims on them. 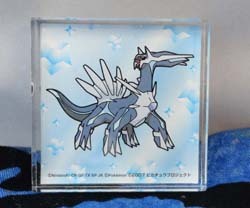 I was happy to get Dialga and all the other ones I wanted from the set! This set seems to be fairly rare, as I search for stamps pretty frequently and just recently ran into it. It's part of a Movie 11 set with Shaymin (Sky), Giratina, Piplup, Pikachu, and I'm not sure who else. All of these were from very similar stationery sets that featured lots of these stamps, then some with words/phrases, and then inkpads. Are there any more? This stamp is big! Well, for a stamp - it's about 3 inches square. This is part of a series that supposedly has one for every Pokemon, but I only saw a few different ones when I was there. The two on the right were on my wanted list for quite a while. 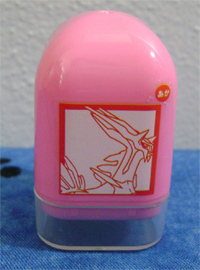 The "すごい" stamp was a surprise find on Yahoo! Japan, although sadly it's a little cracked and has some marker on the side. すごい means 'Great! ", and "みました" in this context probably means "I acknowledge that you did well". And here we have a nicely carved block of wood...just kidding. Strangely, this stamp has no image or anything on the front, but the back features a rubber stamp of Dialga. 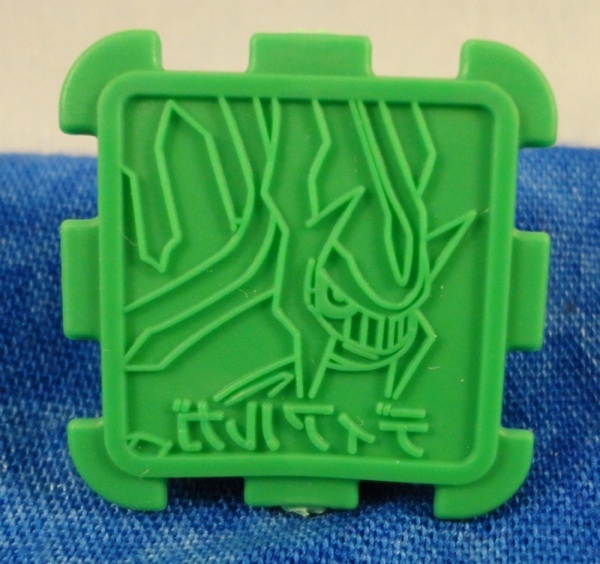 This isn't really a stamp in the same sense as the others, but rather a piece from the Pokemon Stamp Get Game. (It doesn't mention the JR Stamp Rally, but it looks a lot like it!) 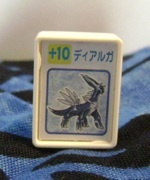 The game comes with a number of these stamps, mostly legendary Pokemon but a few others, an inkpad, and some other game pieces. Toys and Games that don't fit into other categories! This could maybe be considered a figure, but since it's not really solid I'll put it here. It's about 7" tall or so once it's all filled up. 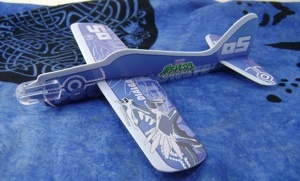 The soft glider series are simple foam planes about 8" long that you assemble from a few pieces, and throw across the room. 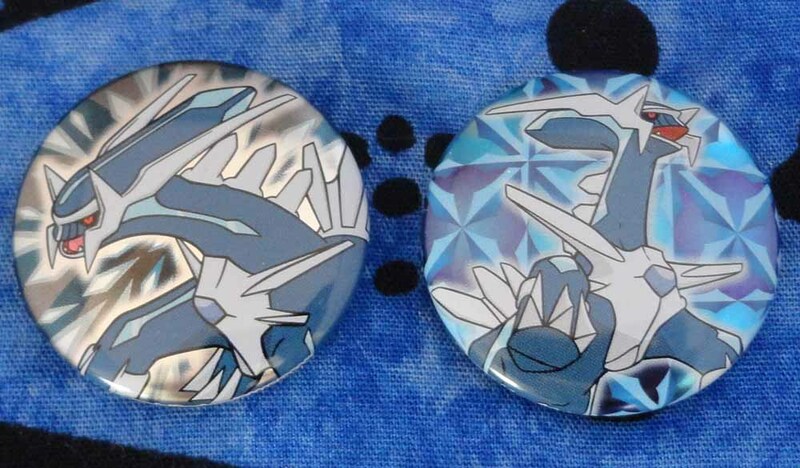 I'd seen them before, but usually they have many Pokemon on them, and I try to just get items where my favorite Pokemon appear on their own. So when I saw that Dialga had a glider all to himself in this Movie 12 set, I had to buy a box! Pom Jong is like Chinese Mahjong, but simplified a bit for kids to enjoy. 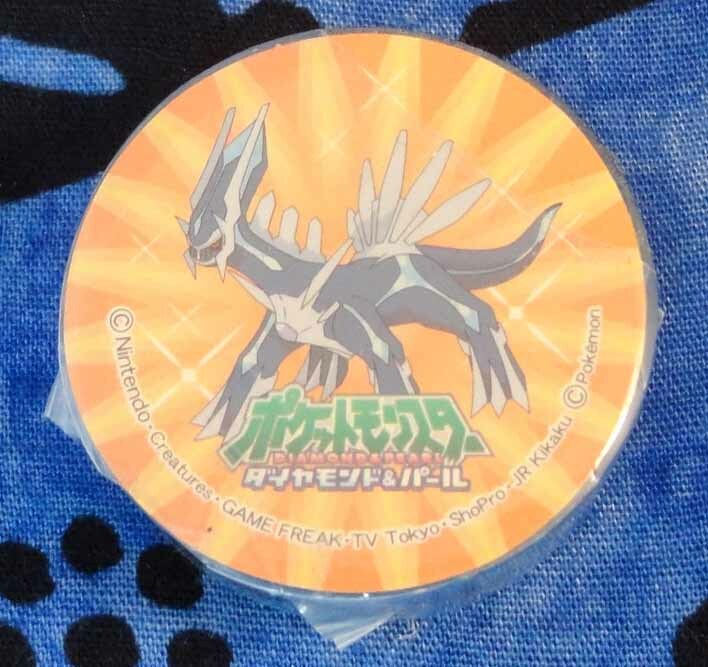 My good friend denkimouse of Sunyshore pointed this set out to me because she noticed the little Dialga in the preview image. 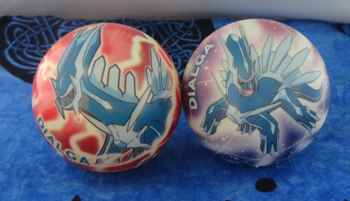 I bought the set and it included 3 (slightly) different Dialga pieces, so here they are! I found this one on an obscure Chinese auction site, though it had Japanese packaging. 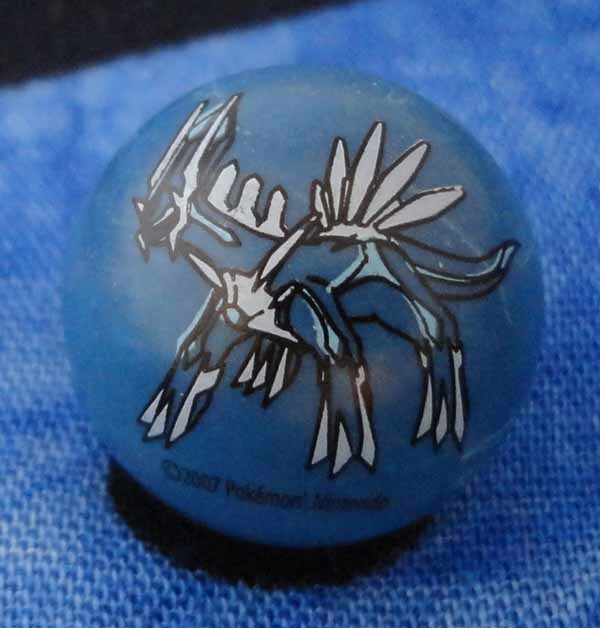 It's a rather small and flimsy little toy consisting of a thin plastic double-sided Dialga, a spring, and a little Pokeball with adhesive on the bottom. These chips seem to be from some kind of promotion in Israel where the (individually wrapped in plastic) chips were included with some food product. It seems to be some kind of toy, but I don't know exactly what… They both have warped shapes, but the blue one is thicker and has grips on the underside, probably to help it fit easily in your fingers. The grey one is clearly from the same type of promotion, but is thinner and doesn't have the same kind of backing. I purchased a large (and expensive) officially licensed Pokemon Perler Beads set while in Japan in 2008. 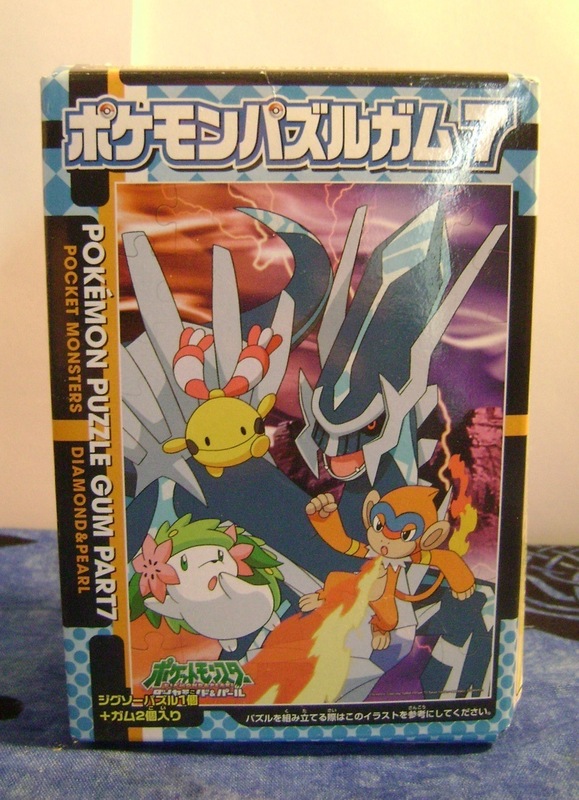 If I recall correctly, it was an 11th movie set featuring Giratina, Infernape, Empoleon, Torterra, and Dialga. 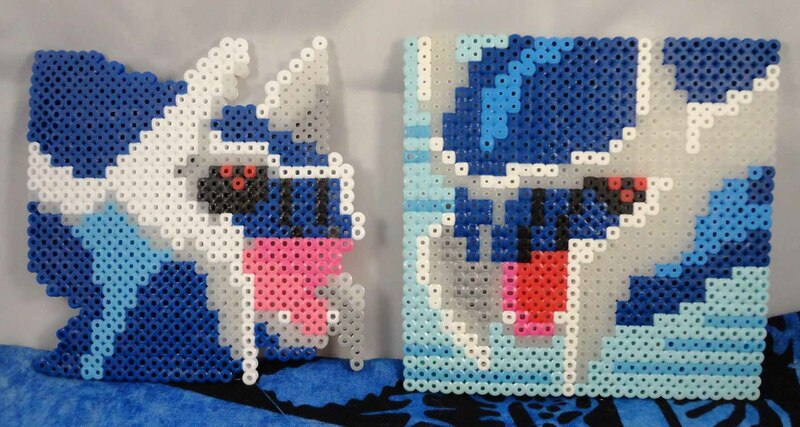 I didn't have any experience with bead art at all, and it took me a few years to get around to putting it together. I then learned that the beads for all of the Pokemon were mixed into two bags and not sorted by color at all, so you had to dig around in the bags to find the color you needed for each bead. What a pain! 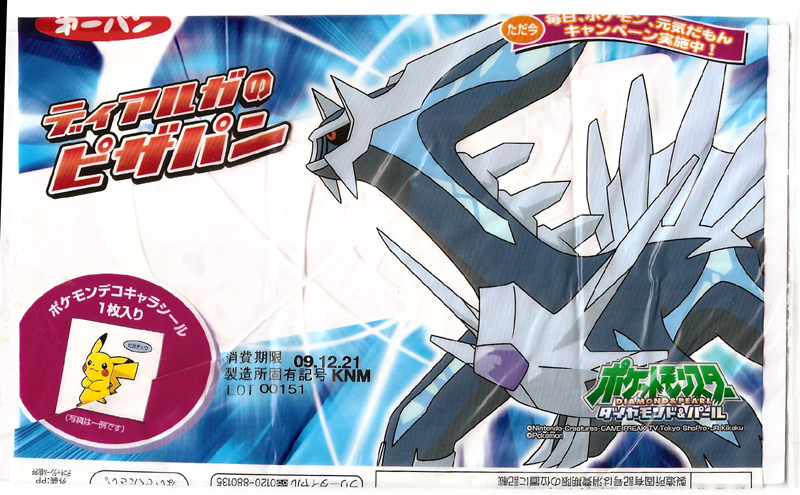 So with this in mind, I was not very happy to learn that there was an earlier general DP set that also featured Dialga. I thought the set would be hard to find, expensive, expensive to ship back to the US, and then I'd have to find a way to put it together now that we don't have an iron any more. I reluctantly added it to my wanted list. 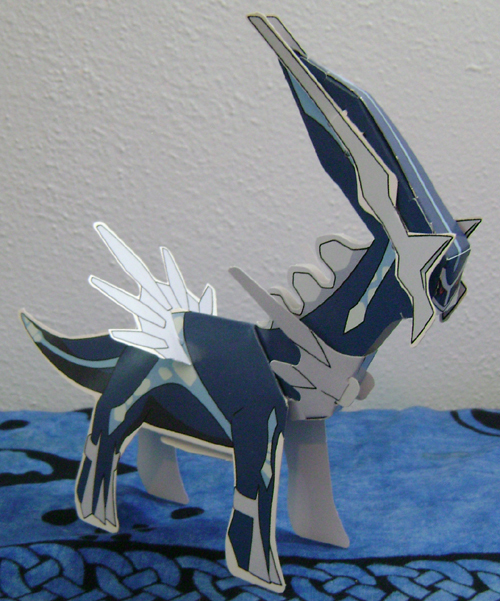 But, I lucked out, because some awesome seller put up Dialga by himself, already assembled, for sale on Mbok! I won him for very cheap, and I'm sure shipping was a lot less for just him than it would have been for the whole set. Now I'm happy to have him as part of this pair! 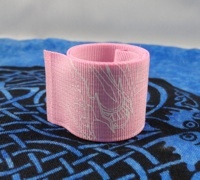 I wasn't sure where to put this one, since it can be flat or coiled or wrapped around your wrist, so here it goes! 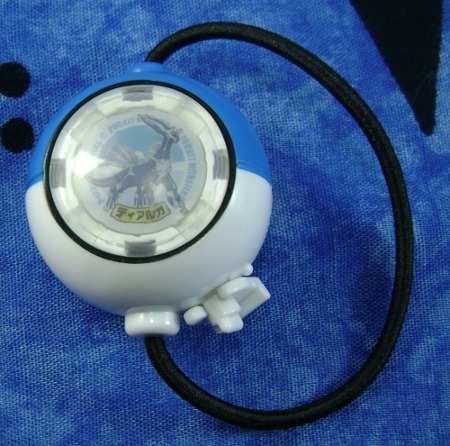 It's cloth with some type of plastic inside that lets it either lay flat or snap into a circle - this kind of toy used to be popular in the US in the 1990's, so I was surprised to see that they have them in Japan too. Dragonheir148 of pkmncollectors showed this in a collection update, and I noticed that I did not have it yet (though I do have another, European cube). She told me that it's a party favor, so I went ahead and bought it a set! Both cubes are the same, but since there are 2 Dialga sides, I may as well keep 2! This game looks like it might have been a freebie with some kind of Japanese kid's magazine. 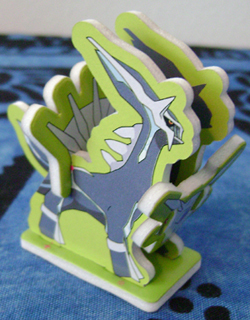 It came with 3 cardboard punch out pieces: Dialga, Palkia, and a central base. I wasn't sure whether the Dialga would make a complete item on its own (like a cube) once punched out, and it turned out not to, but I'll keep it like this as part of my collection anyway. 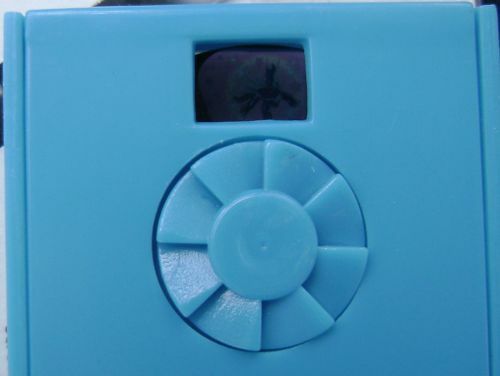 This little toy has 3 different cartridges you can put in. 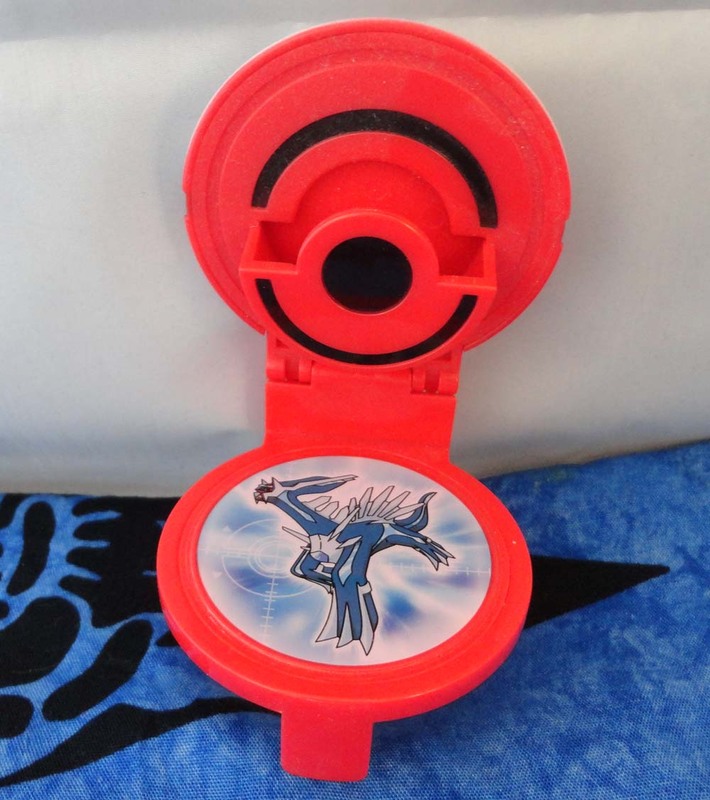 When you look through it, you can see a Pokemon, and pressing the trigger moves on to the next one. I've tried to take a photo of the Dialga slide here. 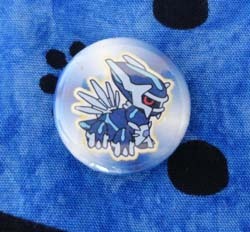 This pin is from a mini bowling set featuring several other DP Pokemon. The pins are much smaller and lighter than a regular bowling pin, and two mini bowling balls are also included. The Parapara here refers to flipping through pages of a book, in this case a Pokedex. If you push the button on the top, it swaps in a different Pokemon, with maybe 10 or 15 on each one. 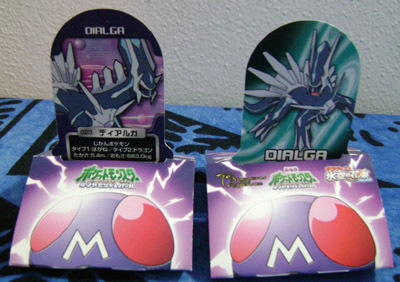 This is the 'Dialga version' as noted on the tag - there is also a Darkrai and Palkia version. 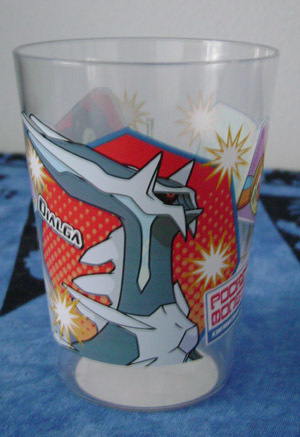 I was a little on the fence about getting this one, because I don't usually go for items where my Pokemon is cut out of a larger picture...but this was a puzzle piece so it was already a single item by itself, and featured no one but Dialga. I figured I may as well, so I picked it up! 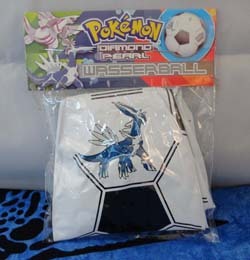 This inflatable beach ball came with a German Pokemon magazine that Eileen sent to me along with the Master Ball figure (on the figures page). Thank you! 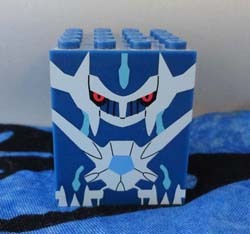 This block is quite flexible and can be turned a few different ways (such as inside out) to display a number of different Pokemon. I'd left it in the package for a long time before I was going through things and realized that one side featured Dialga, and Eileen had sent it along for my collection! These are foam balls about 4" in diameter. 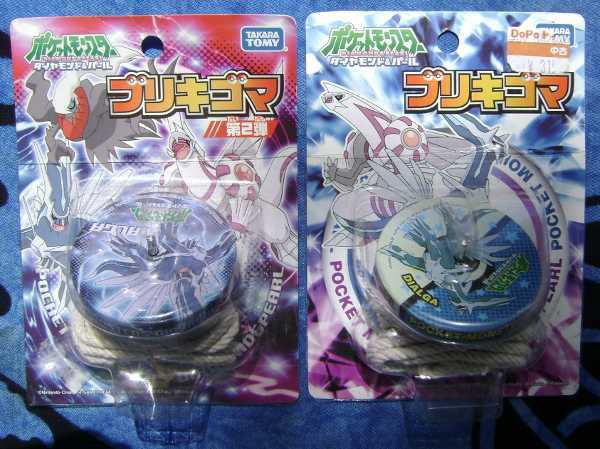 Based on the packaging, I'm guessing one is from a movie 10 set, and the other a movie 11 one? I'm going to leave these in the packaging since they're much easier to display that way! So, you may be able to tell from the rest of this site (and my wants page) that I'm a stickler for things having only Dialga on them. 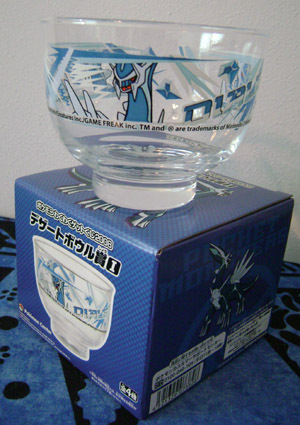 But I made an exception for this one, because Dialga takes up most of the space, it's unique art, and crystal puzzles are just neat. Part of a set with many (movie) Pokemon, in small 96 puzzle sets. This is a tiny little chip from some game, maybe about 1" in diameter. 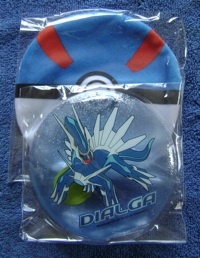 The Dialga part of a bubble blower set. This piece attaches to the wall and has another piece that blows bubbles from it. 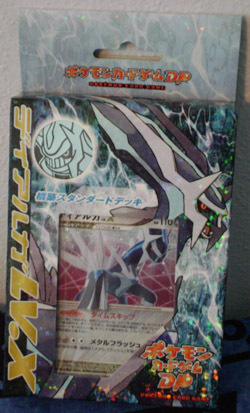 Some of the few actually metal Dialga items! I haven't opened it up since it looks like the rope could be a bit messy, but it looks neat. This marble comes with the individually-packaged Jakks figures, but you don't get it if you buy the figures in a multi-pack (as I did). Thankfully I was able to get it on Sunyshore without buying the figure again! This seems to be for some kind of game. Let's battle with Yo-yos! 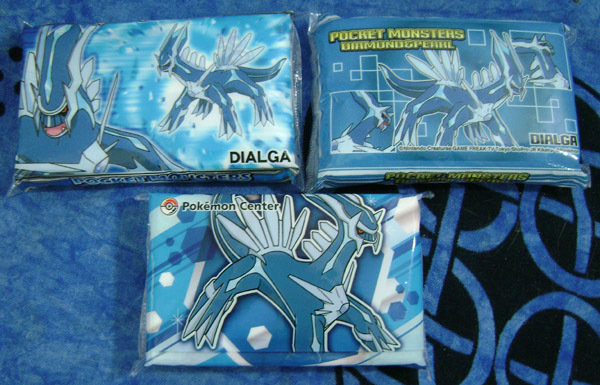 This set has other Pokemon on it as well, but hey, it's called the 'Dialga set'. 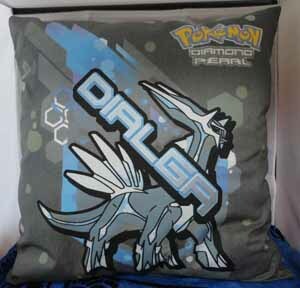 That means it's Dialga-centric, right? 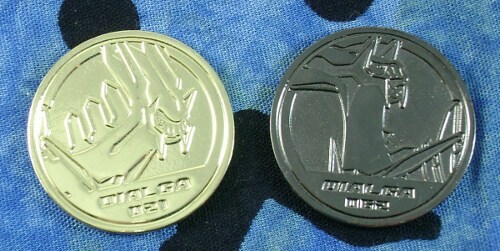 Battrio is an arcade game in Japan where you purchase plastic pucks from the machine (and get a random Pokemon), and then battle those pucks against another person (or computer). I held off on buying these for a long time because there aren't any Battrio machines around here (or anywhere else outside Japan, as far as I know) so it was pretty expensive for just a plastic puck. I finally caved due to the neat art, though! 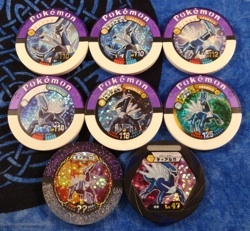 Here we have: 01-001, 01-001 BS, 02-001, 05-002, 09-002, 16-002, and 18-002 from DP sets, and V01-041 from the first BW set. The first two have the same pose, but are otherwise quite different, as one is a holo and both have different numbers. Perhaps the holo one is some kind of promo? 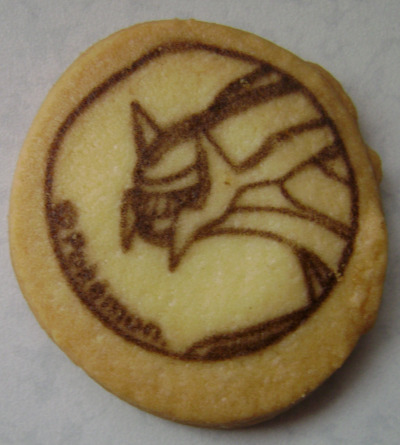 If you'd like to see more Battrio, the official website (with photos of all of them!) can be found here. 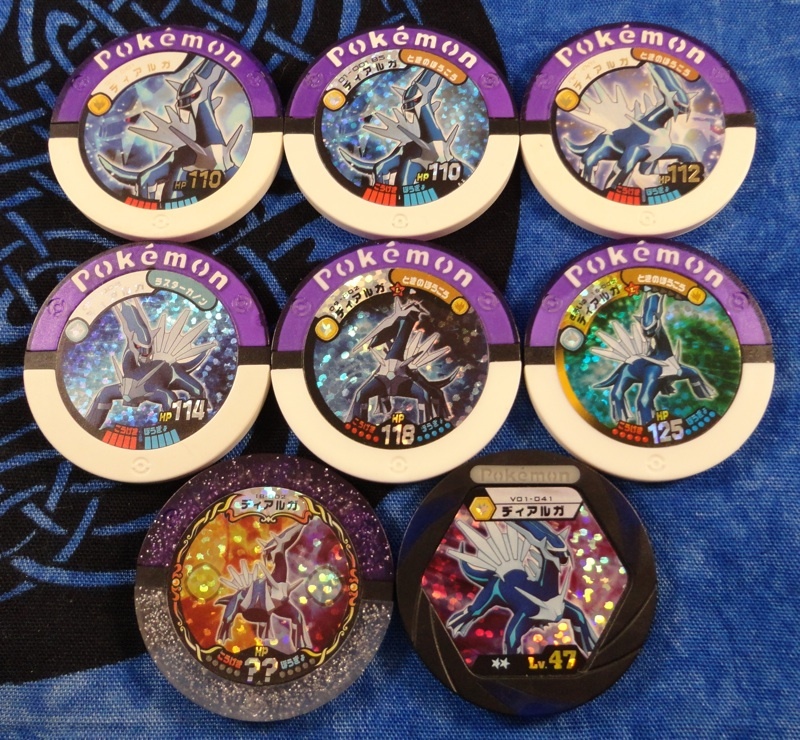 The light blue one is from a Japanese Dialga theme deck, though I believe I got it separately from viper_fox. 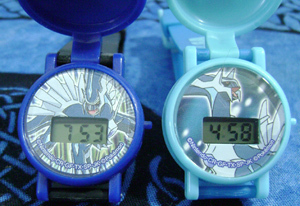 The sparkly blue one is from a Korean set, which viper_fox split up with me. 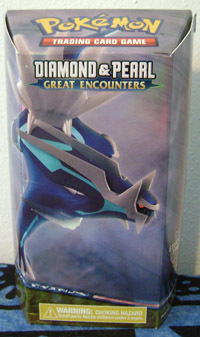 The sparkly silver one is from the US Great Encounters Theme Deck. 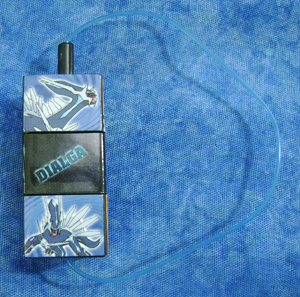 The one with the different design I can't remember the origin of, but it's probably from some US pack, as it seems fairly common. Food Items - they might not be edible now, but they were at one point! I picked both of these up at the Pokemon Center during the summer movie promotions. 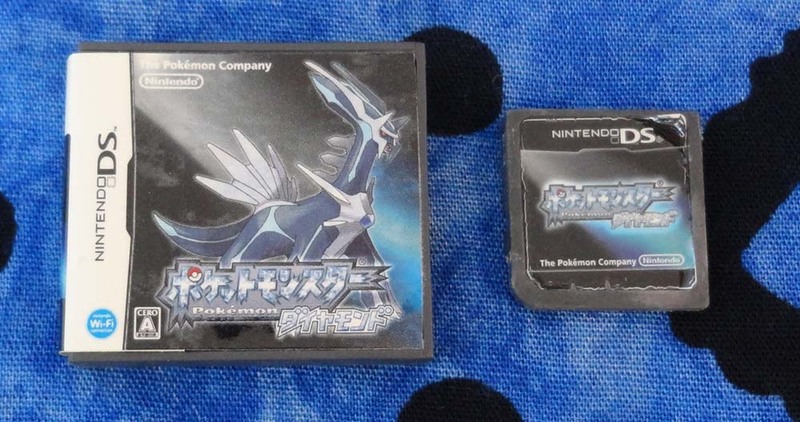 The one on the left is the 2009 edition, and the one on the right is from 2008. I don't plan on eating either of them! 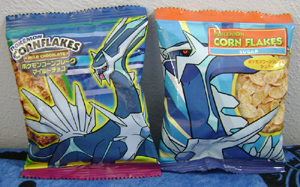 These cookies are blind packaged with many Pokemon in the set, but unlike those in the above set, the packages are made so that you can't see who is inside until you open it. 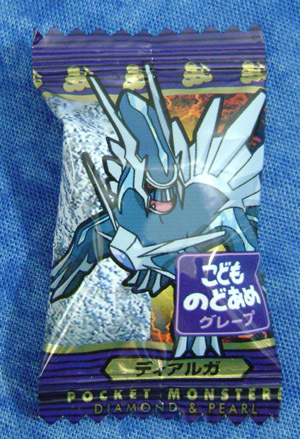 While eating the others here, I came across a Dialga one to add to my collection! 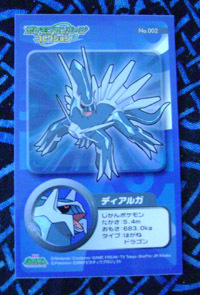 I bought three packages of these over various trips hoping to get a Dialga one, and finally got him! 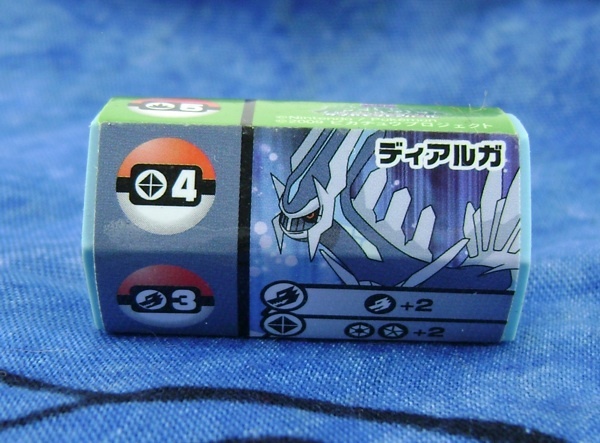 The candy is fruit flavored and doesn't have any design on it (as I know from eating others featuring less interesting Pokemon) so I'll leave it in the package. 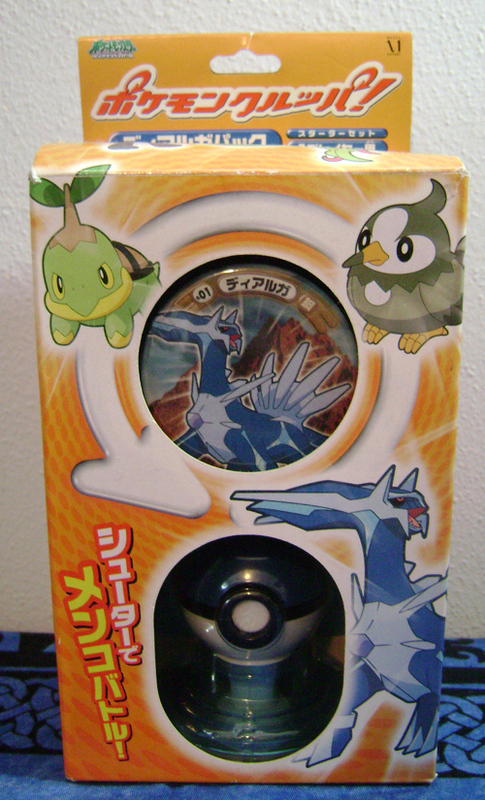 Food items like the above are usually items that you simply can't get unless you're in Japan, which is one reason I was very pleased to find this box for sale on pkmncollectors! The candies originally in this box were yogurt flavored. 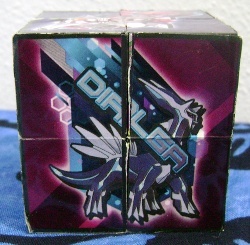 A chocolate cube featuring 6 different Pokemon, including Dialga! 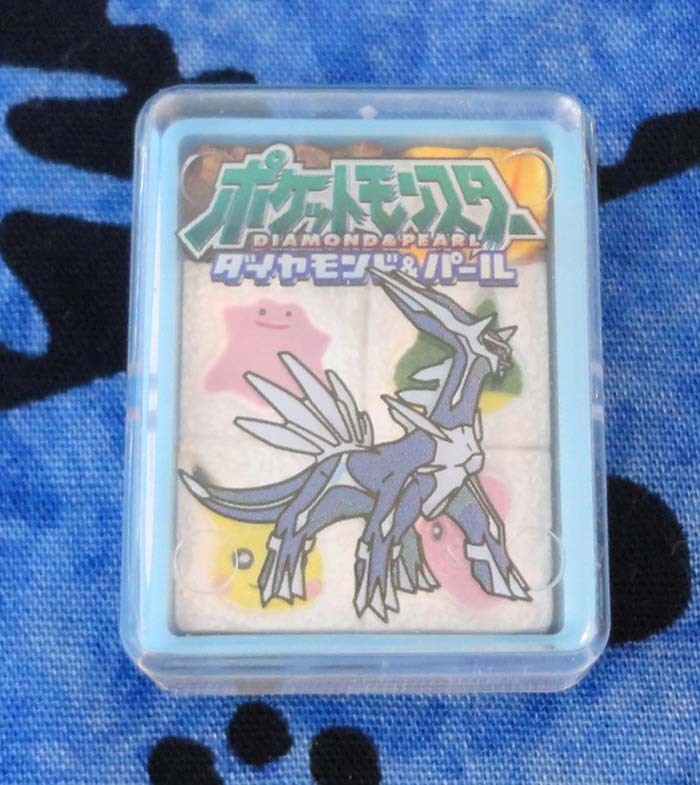 I saw a picture of this on the Pokemon Goods site and thought it'd be discontinued before I had a chance to try it, but soddymothdust kindly volunteered to get one in Japan and ship it over to me. It was light and fluffy and delicious, just as I expected! I was really excited to find that the pizza pan had been re-released, and bought several of them when I found them in Japan. However, it seems that they added ham to this version, which I don't like quite as much. 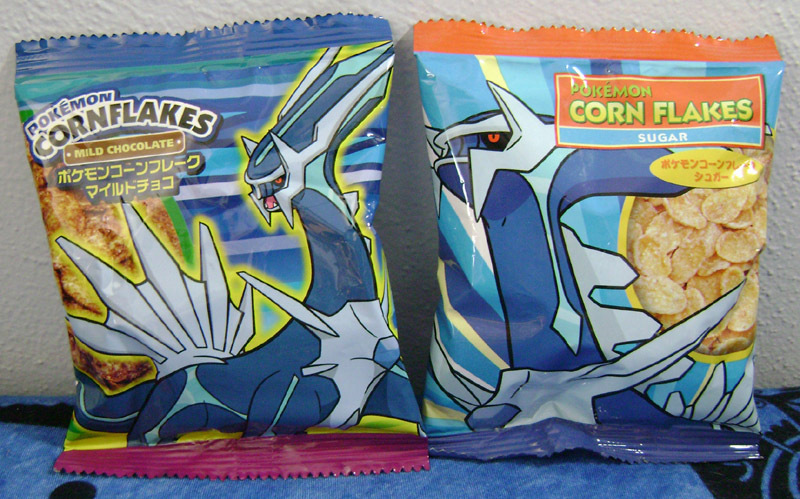 Ah well, still Dialga food! 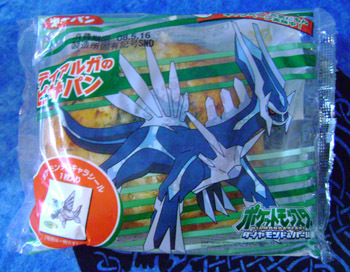 I was surprised (and excited) to find that Dialga had a third version of his pizza-flavored bread released, but my friends in Japan couldn't find it for sale anywhere. Since you pretty much to have to have a contact in Japan to get these (as the chance of them showing up in an auction is almost nonexistent), I had almost resigned to the fact that I'd miss out on this one. Part of a set with various Pokemon. I tested on a Pikachu and the gum itself is plain white without any design, so I'll just keep him in the package here. 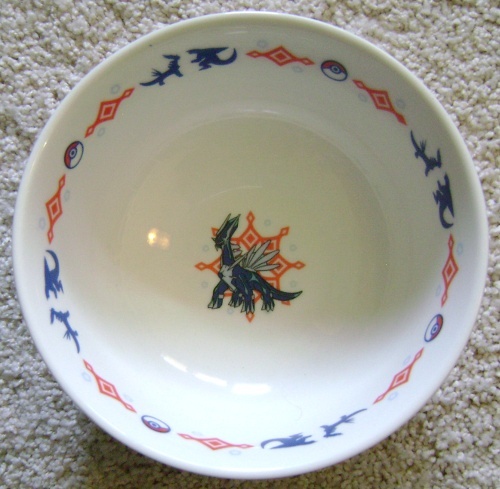 Dishware - cups, plates, and more! This was one of my most wanted items for quite a long time. Although I usually would consider something with both of them on it to not be Dialga-centric enough to pine after, the solo Dialga in the center of the bowl (and also on the bottom) make this an important piece in my collection. I came across this mug in an old pkmncollectors search (that I actually ran into while searching for a totally different item). 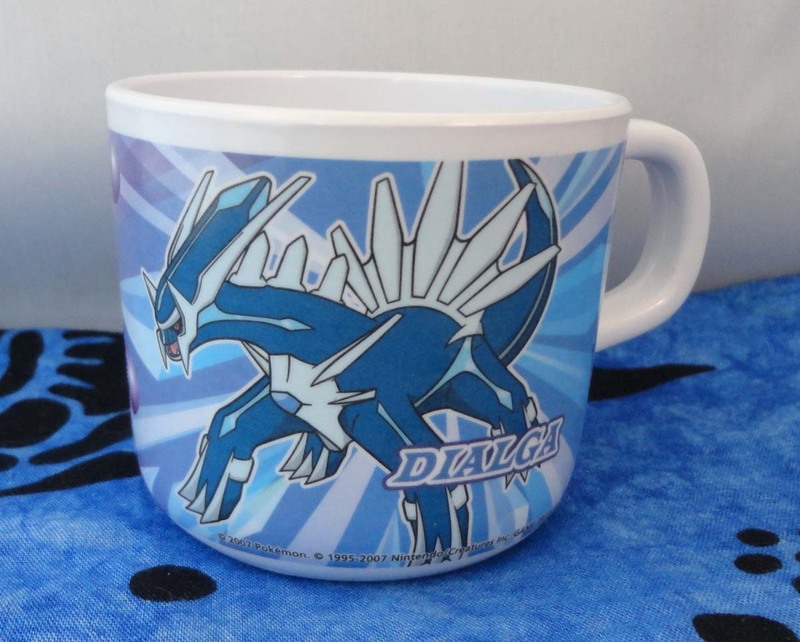 A quick eBay search (for 'Pokemon mug' instead of 'Dialga mug' or 'Dialga') turned up a set with a buyout, which I quickly snatched up! Unfortunately, mine has a manufacturing defect on the opposite side, so I'd like to buy another that isn't damaged, but for now I'm pretty happy to have this one. This plastic mug has a section with water in it, in which small sparkly pieces of confetti float. Shake it and see them fly! This is from a series of cups where there is water within the plastic layers, and little things (like plastic stars) floating around in it. You can refrigerate (or freeze?) the cup to make or keep your beverage cool. 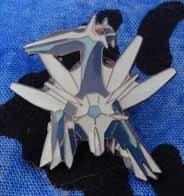 This one has Dialga on one side and Palkia on the other. 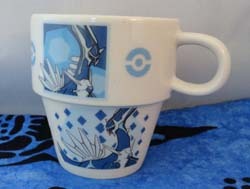 The other cups that I've seen in the set featured Arceus, Giratina, and Gizamimi Pichu. 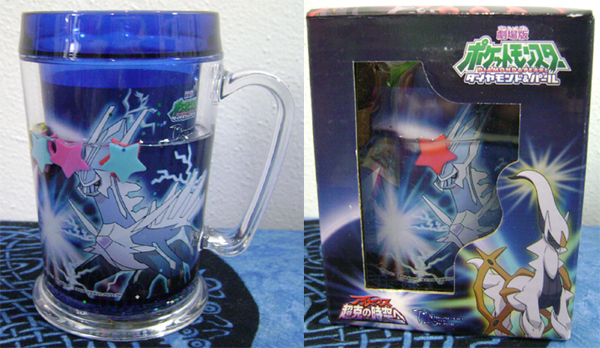 I've seen quite a few of these sets now - I believe they're UFO prizes and feature 4 cups each. 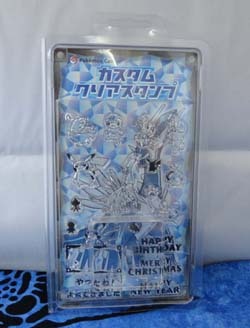 Here is one from the 12th movie promotion that features Dialga, Palkia, and Giratina on different sides. This mug from a children's dishware set features Dialga on one side and Palkia on the other. I found this mug in a small lot of Pokemon Center items. I'm not fully completionist about items like this, but I hadn't seen this one before so I thought I'd pick it up. Even though this item isn't totally Dialga (it has Darkrai and Palkia on the other sides), it's a gorgeous piece. 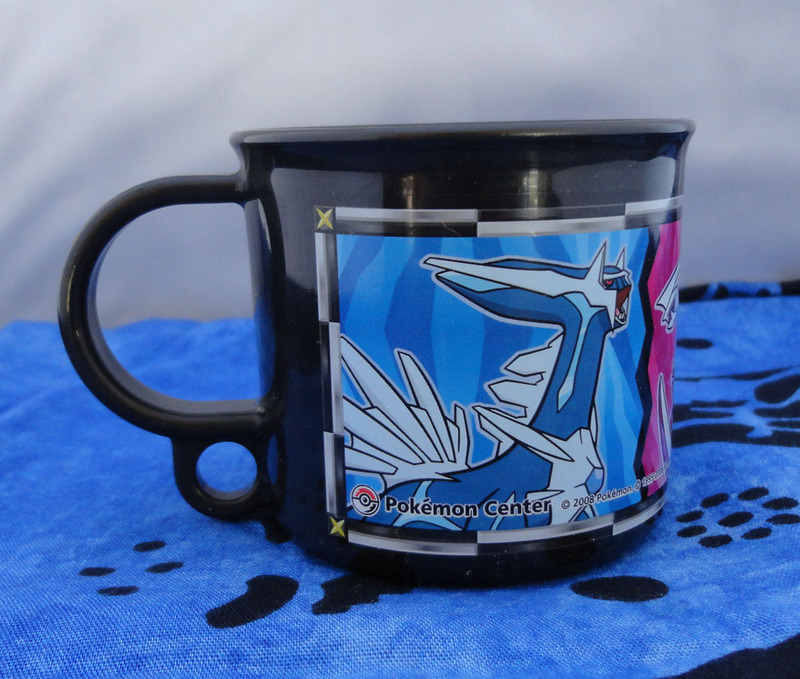 It's hard to find actual ceramic Pokemon items, as most are plastic, probably so as not to be easily broken by kids. 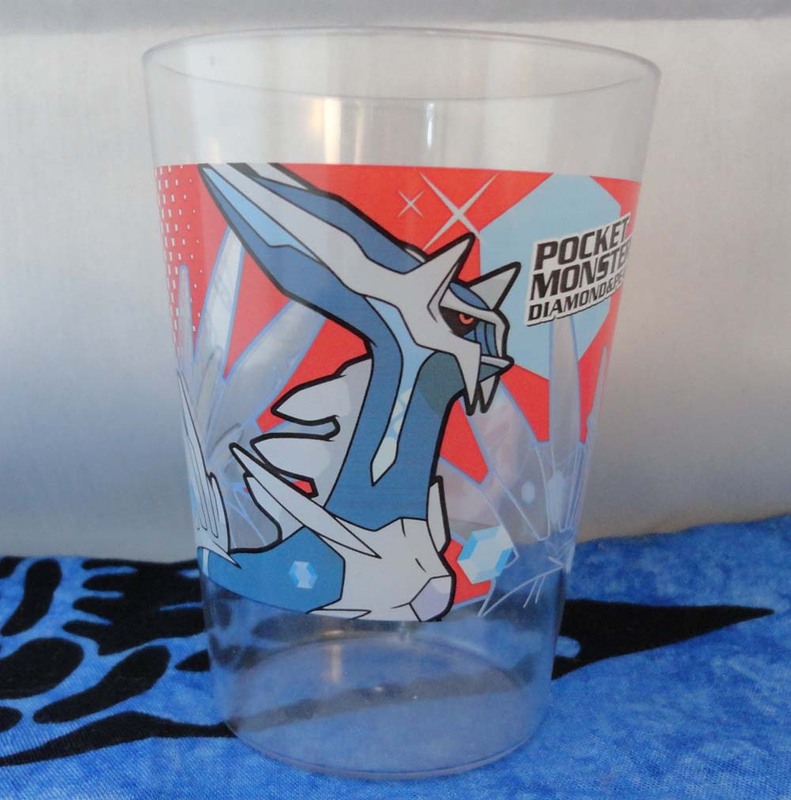 So, a funny story about this cup. 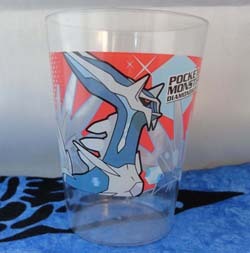 Some months before I got this cup, I had another one, that looked like this. Pretty much the same pose, but it only had Dialga's face, and it had a bunch of other Pokemon on it, which I really prefer not to have for this very-focused collection. 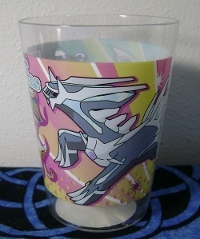 A fellow collector friend saw the cup and got really excited about it, because those other Pokemon were all ones she liked that were rarely featured on anything, and together even more rarely. I traded the cup to her for a few other goods that are now on this site. 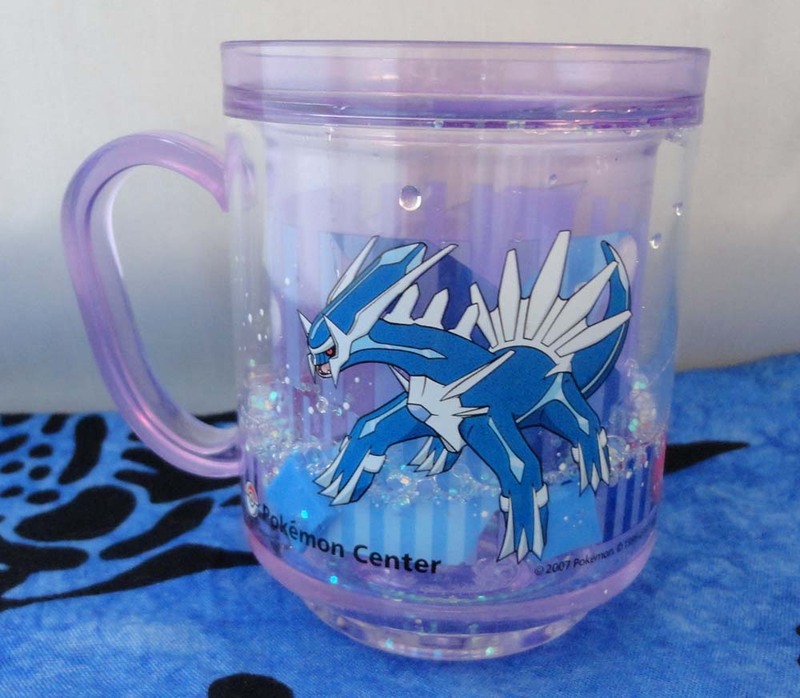 This cup isn't quite a mug, but it's not a tumbler either. What can I call it? 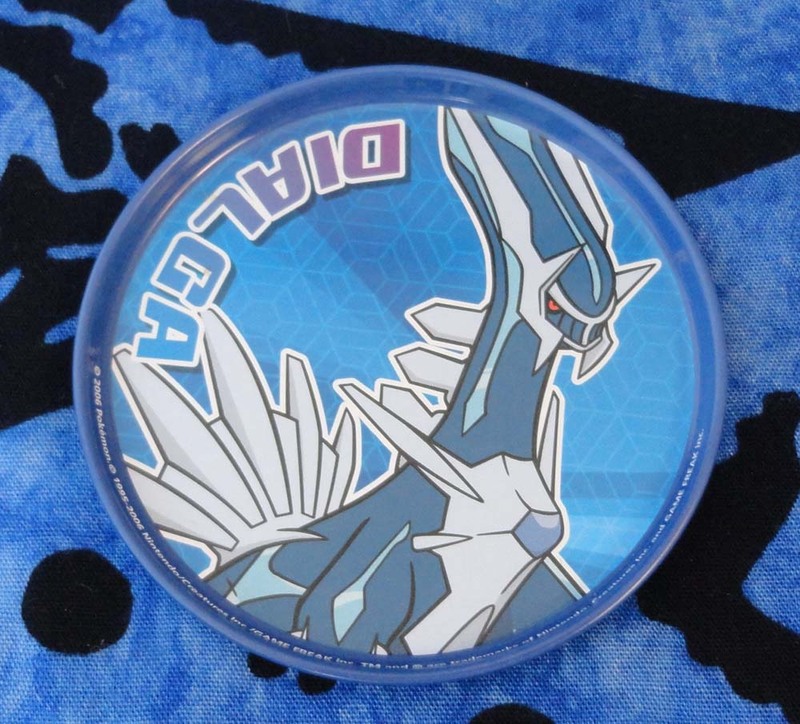 A nicely sized metal coaster that you can set your drink on. 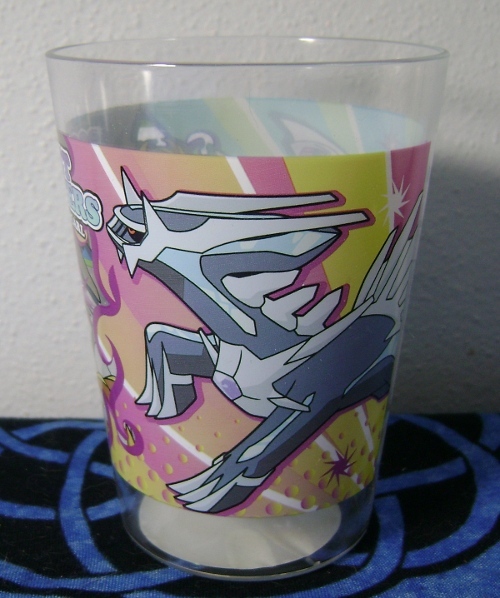 Large enough to fit a fairly large cup or glass, but I won't be using it since I'd rather keep it a part of my collection. 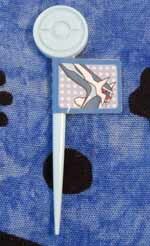 A spoon! There's also a fork that has Palkia on it, and a fork that has both of them on it as part of a child's dining set. After a lot of hunting and looking at overpriced lots, I now have Dialga's first 3 battle wheels! (I sure hope there aren't any more that I don't know about! >_>) They're basically metal tops with a shimmery sticker on top, that you can launch against each other to 'battle'. For some reason, these toys seem to be really expensive to buy secondhand even when new, though I know they're just 200 yen in the gachapon machine. Maybe it's that they're not very popular? The first one is a lucky find on Amazon, the middle one is from mana_mihara on pkmncollectors, and the third one is from a set with Piplup I bought on Mbok. They are fairly neat toys I think, but just a pain to track down for a decent price! I was surprised to come across these toys in a gachapon machine, as I'd never seen or heard of them before! I've opened hundreds of gachapon capsules in my time, but these had the most stubborn ones I'd ever seen. I ended up smashing them on concrete to open them! 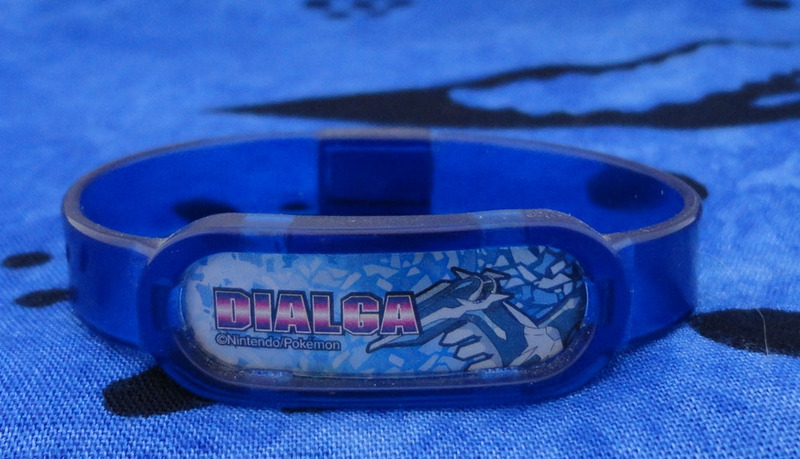 Anyway, this is a wristband with a small knob on the side, which you can turn to have the front part glow. 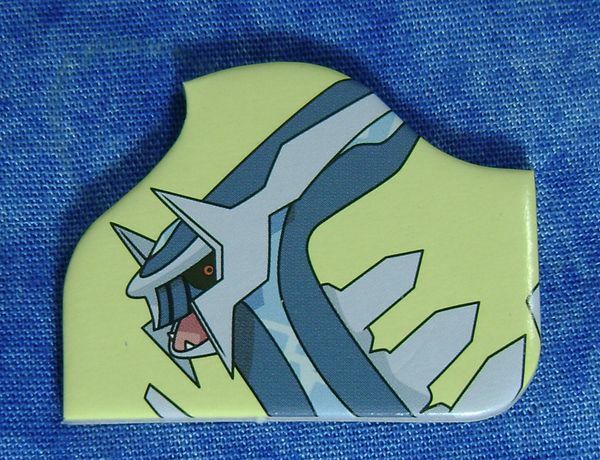 This isn't really a pure Dialga item since it has Palkia, Giratina, and Regigigas on the other sides, but I generally allow things in if they have one full side of just Dialga. 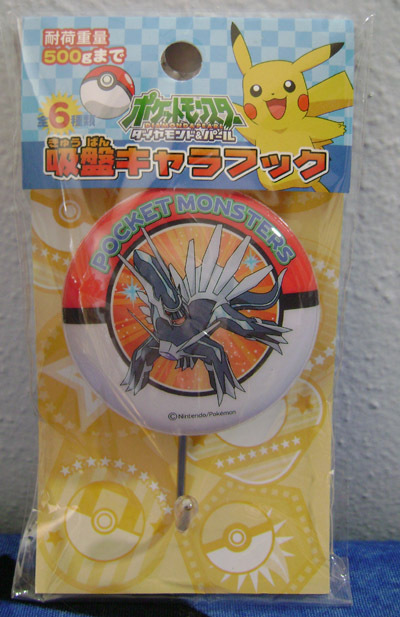 This is part of a Gachapon set from the Giratina/Shaymin movie. 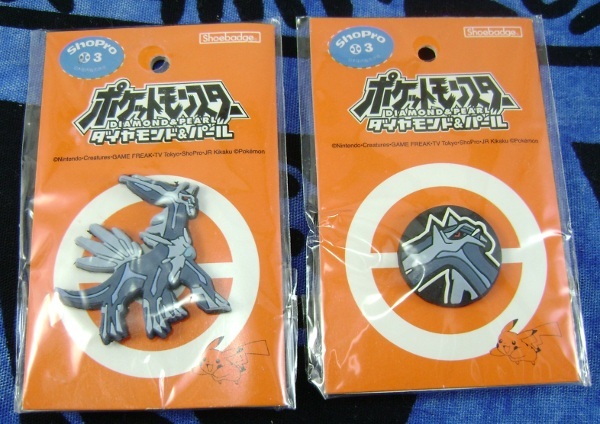 The Metal Collection figures are one of those series for Pokemon that's continued for over 10 years. 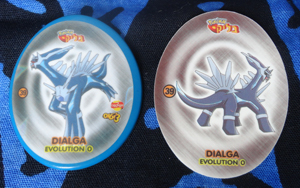 There haven't been very many Diamond and Pearl Pokemon featured in them, but I was hoping Dialga might get included. 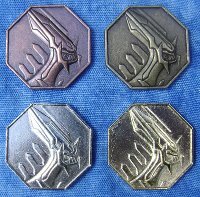 Eventually, he did, but instead of a figure they chose to make a flat (although relief) metal coin. The first (silver) coin here I got in a lot on Yahoo! Japan, but for whatever reason I could never find any of the others. 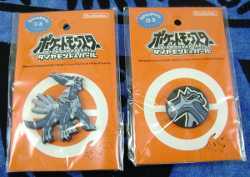 Then Meowthcollector offered me the bronze one and I was one step closer, and then I went to the Tokyo Pokemon Center in summer 2010 and found that this series was still in the machine! 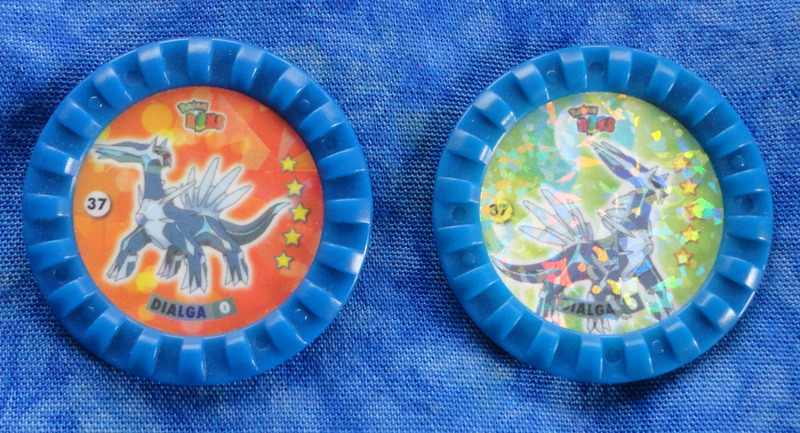 For some mysterious reason they chose to combine two of these series in one machine, which meant that there were about 15 Pokemon and 4 colors of each, making dizzyingly bad odds of getting the one figure you wanted. I planted myself in front of this machine with my 100 yen coins and resolved to keep trying until I got Dialga, the machine was empty, or I ran out of money. 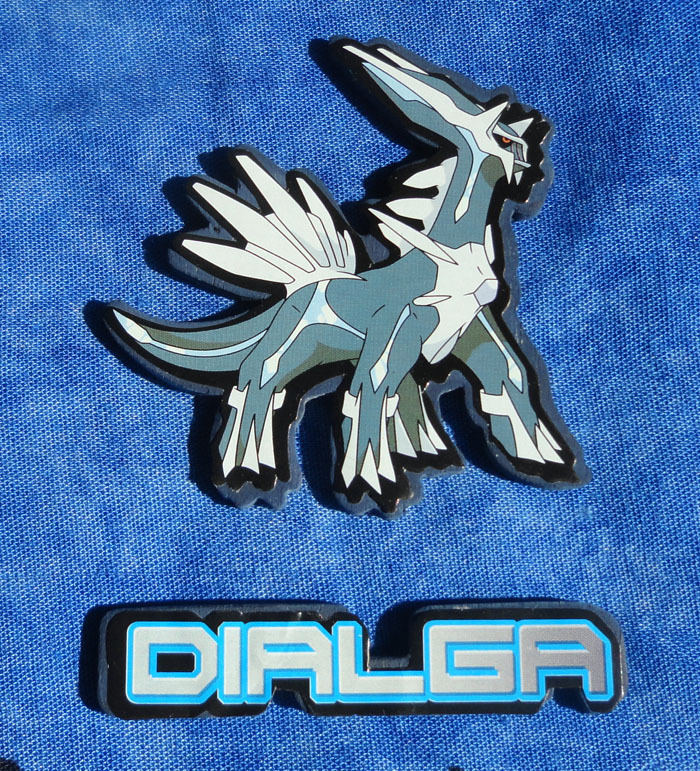 After some 40 tries I finally got the 2 colors of Dialga I was after. A hard-fought win, yes? Unlike the more serious 10th movie watch at the bottom of this page, these are more like a kid's toy. 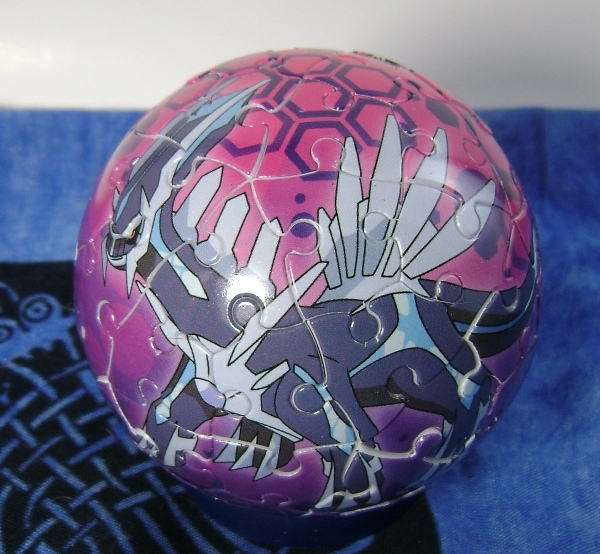 The cover is a Great Ball that lifts up to reveal Dialga (and the time along with him). The darker one on the left is from the 11th movie promotion, and the one on the right is from the 12th movie. 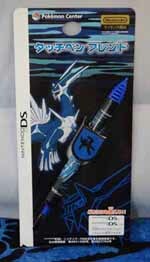 Yet another stylus, but this one has a flat lens cleaner on the end rather than a figure. 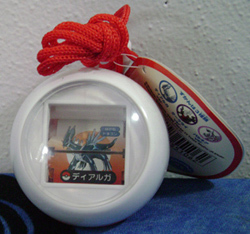 Part of a gachapon set of tiny erasers, in the form of Pokemon-shaped bento meals. 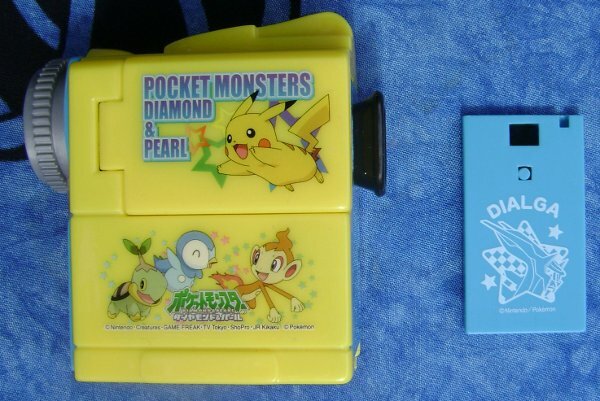 This one is also part of a gachapon set, featuring most of the 3rd and 4th generation Pokemon games in miniature, with the cartridge as a tiny eraser. Another addition to my 'Diamond' collection! 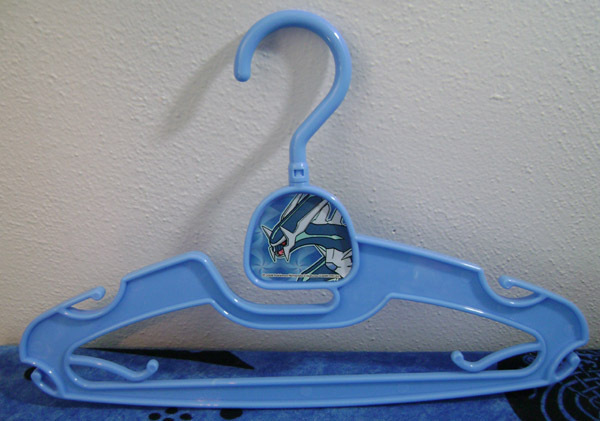 This is part of a set of brightly colored coat hangers sold in the Pokemon Center, featuring 11th movie Pokemon like Giratina and Shaymin. 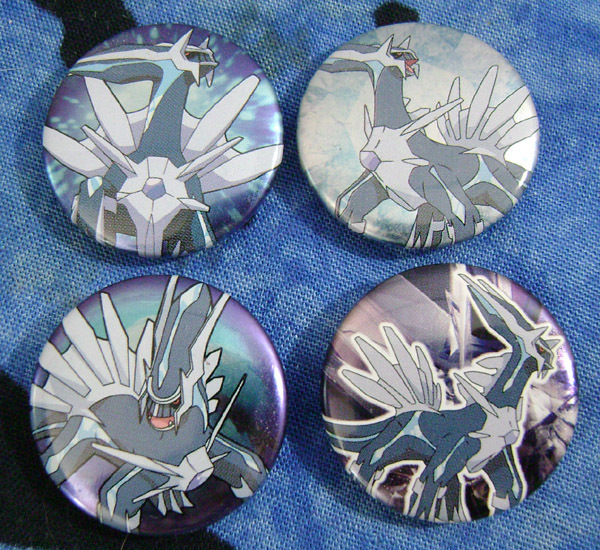 I nabbed the Dialga one and split up the others with my friends. These appear to be for some sort of game, though I don't know much else about them. 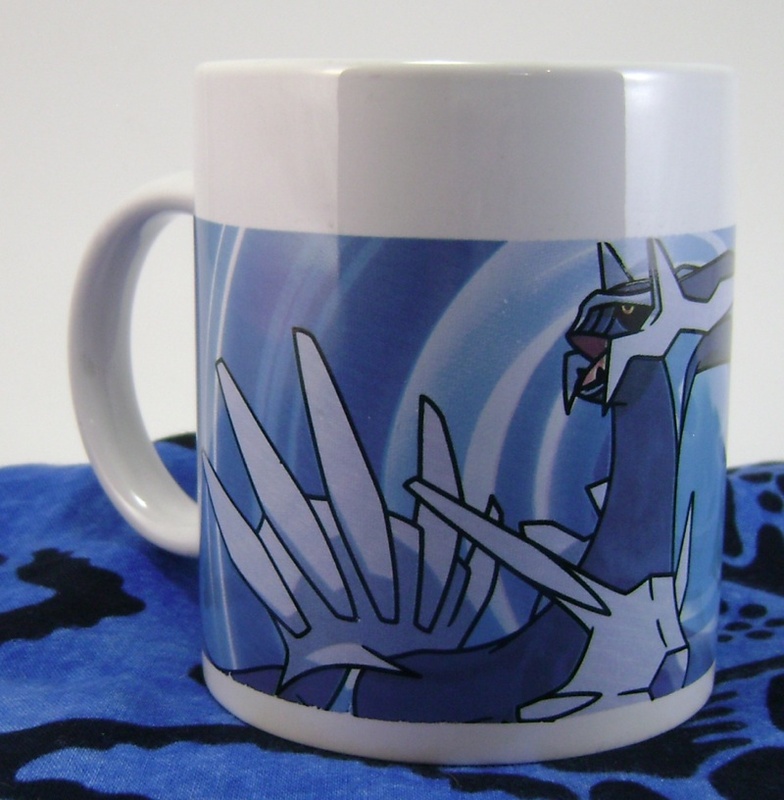 I wonder if Dialga has any more that I missed? A little eraser from the 12th movie promotion, featuring Palkia on the back. This one was on my wanted list for a long time, but if I'd actually known what it was, I'd have made more effort to get it sooner! It's a heat/cold pack - twist the piece inside and it heats up, or stick it in the freezer to make it a cold pack. If used as a heat pack, you can boil it to reuse it. 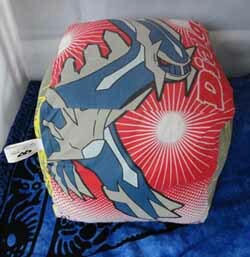 It also comes with a Pokeball-styled cloth pouch so that you don't burn yourself by putting it directly on your skin. 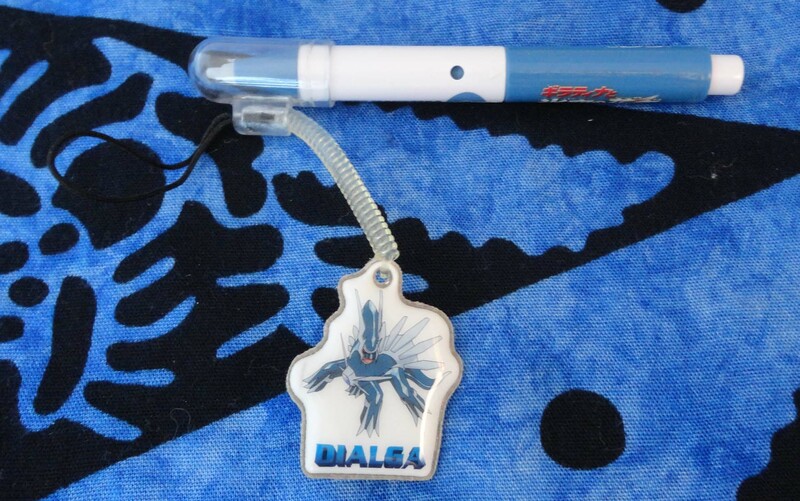 A cloth lanyard featuring Dialga on the strap. 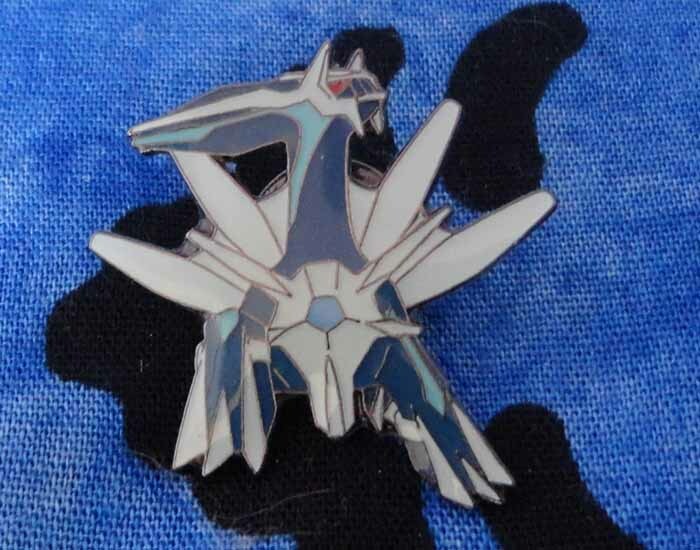 I first saw this in BlazikenBabe's collection post on pkmncollectors, and considered asking her to get me one, but I found one on eBay UK so I didn't have to put her to the trouble. 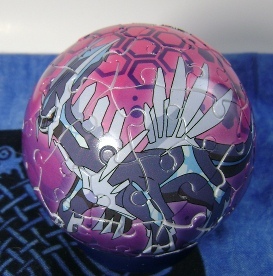 I was surprised to find that the ball was made of plastic instead of normal puzzle cardboard, and found it enjoyable to put together. A hard and shiny little button. It has a little loop on the back so that you can sew it to something! I spotted this band in a huge lot of other random items, and had to get it since I'd never seen it before. 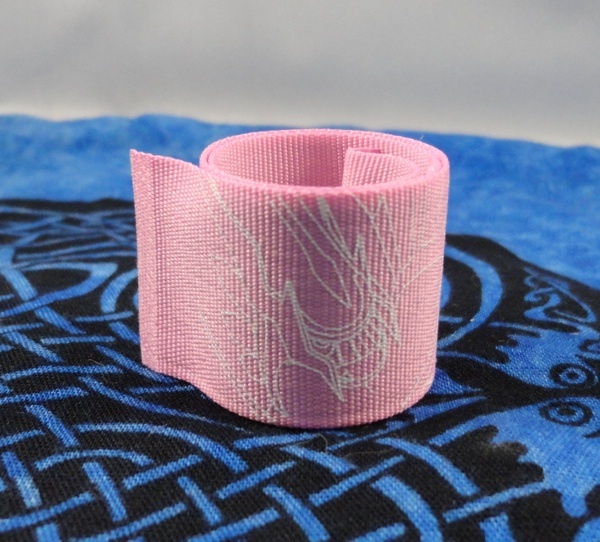 I knew it would be too small to wear, but it's a hard plastic and you'd have to have a pretty tiny wrist to fit it! I had this one for quite a while, but just recently noticed that it'd never been added to the site. Whoops! 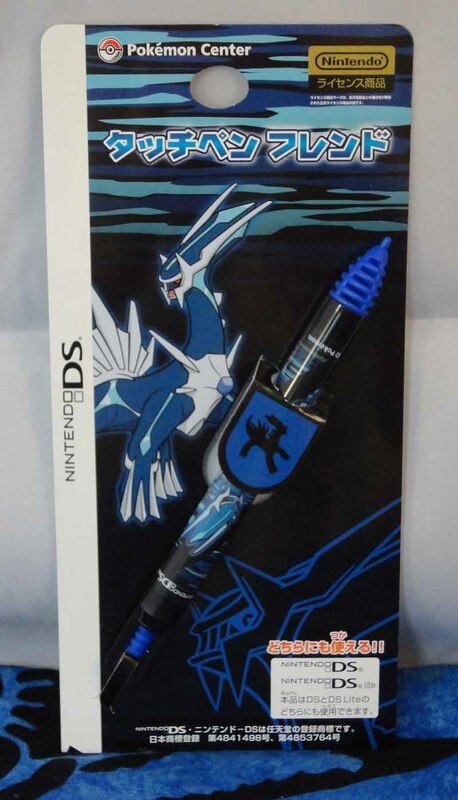 I usually take items out of the package, but this one has pretty cool packaging and styluses can be hard to display, so I've left it in here. The stylus itself is rather decorated and wrapped around with Dialga images. 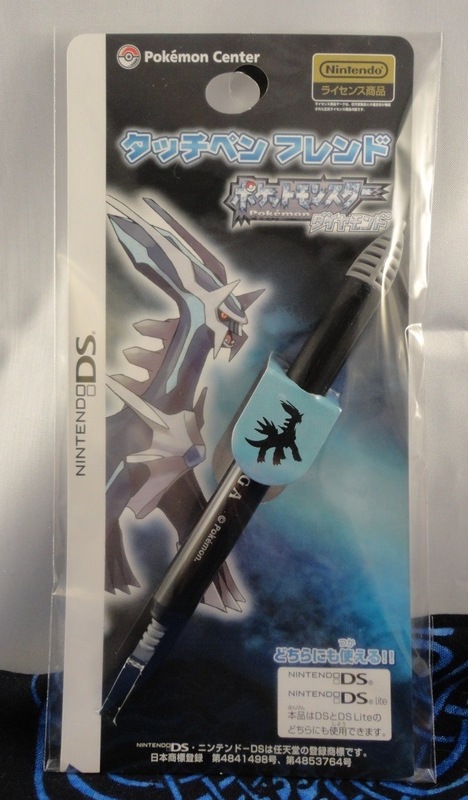 I had a loose version of this stylus that showed up on Rakuten for a while, but now I found a second one new in package! 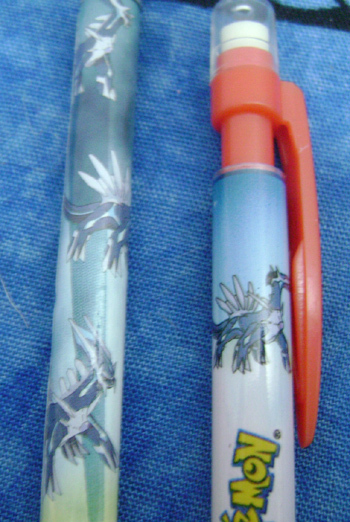 It turns out that it's pretty similar to the above stylus, and actually, it came in a lot with another of those. 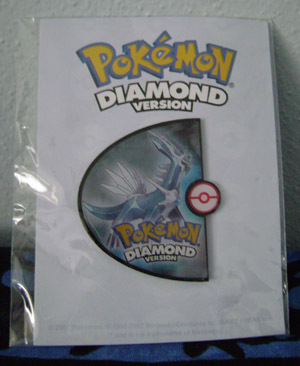 Like the other one, I'll keep it in the package, and now I know to add it to my Pokemon Diamond sub-collection. 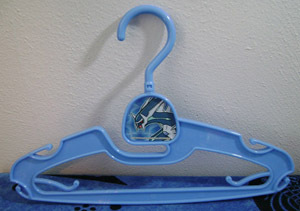 I'm pretty sure I bought this item in Japan, but it got overlooked for several updates, and I've since forgotten exactly where I bought it ^_^; It says that it holds up to 500 grams in weight, though - perhaps I should stick it on the wall and hang a bag or purse from it! 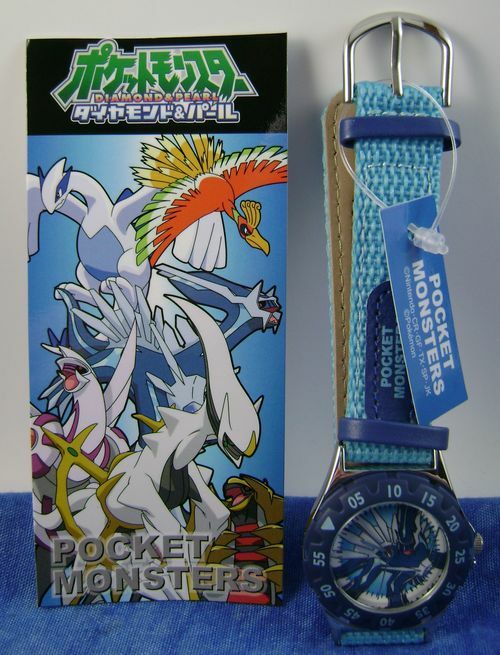 It had Dialga on it, I bought it. That's really all there is to it. To make bathtime more interesting, you can draw on the walls of the tub with this crayon! It also comes with a Dialga card, which is plastic of course, so it doesn't get immediately ruined in your bathtub. These pieces were part of a larger set that also featured Palkia, some other pieces, and a backing. The intent was that you paint the pieces and the backing (using the dark blue paint provided), attach the stickers, and glue the pieces to the backing. Then, you hang the sign on your door (or your child's door, as it seems to be meant for children) to either invite in or ward away guests. I opted to just paint the two Dialga pieces for my collection and leave the rest as they were. I can't find the username of the community member who sold me this kit, please let me know if it was you! I've finally got both of these clips meant for Crocs-style shoes. I wonder if there are more, though? I thought these were some sort of caps when I bought them, and didn't realize they were headphones until they arrived. Oh well! 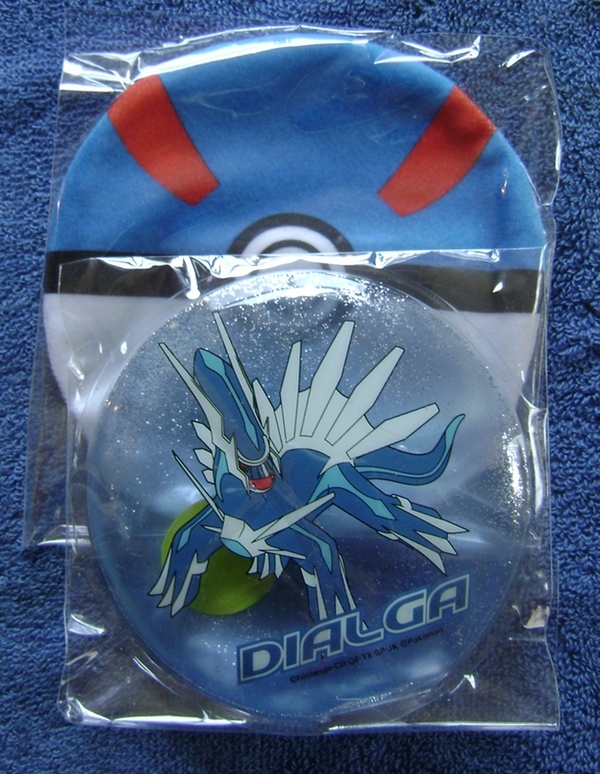 The set is actually a pair of Pikachu headphones, but it comes with Dialga and Palkia caps you can put on over those too. 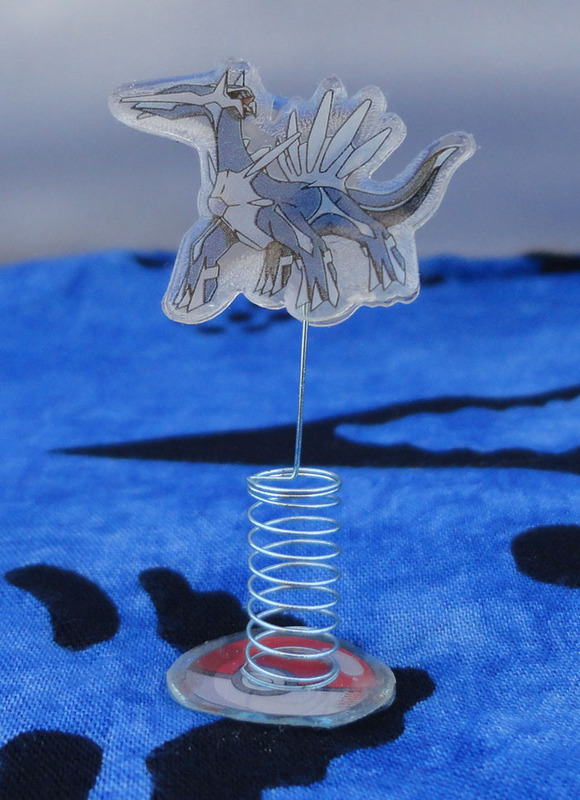 A small toothpick with Dialga's face on the flag, from a set sold in the Pokemon Center. 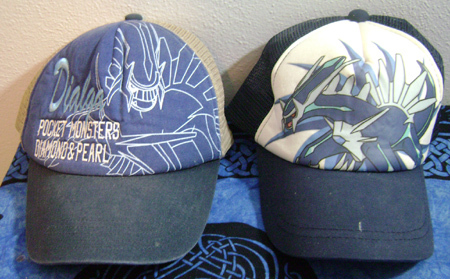 I couldn't find either of these (or any other hats) in Japan, so I had to import them. I think Dialga has a lot more hats than just these, but they're a bit expensive and difficult to find. I don't generally collect child's sized Dialga clothes, but Pokemon hats are pretty uncommon and I can at least somewhat wear it myself. I found this one on auction, but it looks to be in like-new condition. 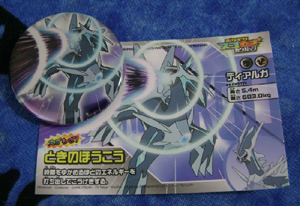 When in Japan, I try to buy everything I see (and don't have already) that had Dialga on it. That included this miniature cupcake foil in 2008, and they made a new version in 2009 for me to pick up as well! 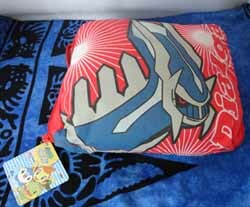 As you might have noticed from things like the above, they have a wide variety of Pokemon items in Japan. 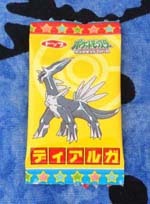 These are from packs of 6 tissues featuring Pokemon or Pokemon-related things (such as the Pokedex or Pokeballs). 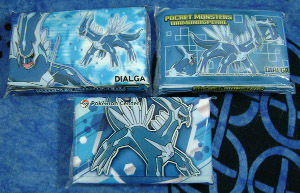 Dialga was actually featured in 2 different packs in 2009, so I grabbed both when I saw them in stores. The one on the upper right is an older version where I bought the set on Yahoo Japan. A cap to...keep a pen's ink fresh, I think? 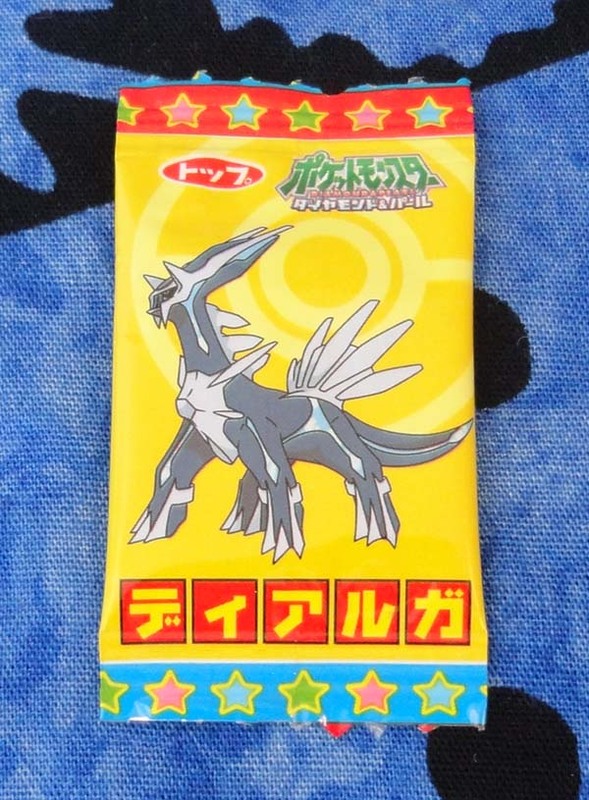 Dialga got a new one with the 12th movie set as well! The other two I didn't find when I went to Japan in 2009, but Crunch found them in Japan in 2010, so I'm not sure if they're newer releases or just less common. The square-looking one is part of a set that locks together. While browsing Toys N Joys for images of some items on my wanted list, I happened upon these pencils, and if I squinted, it looked like Dialga might have his own pencil in each set. I started to add them to my wanted list, but then I realized I should look a little more, and I found both sets on Amazon without much trouble! 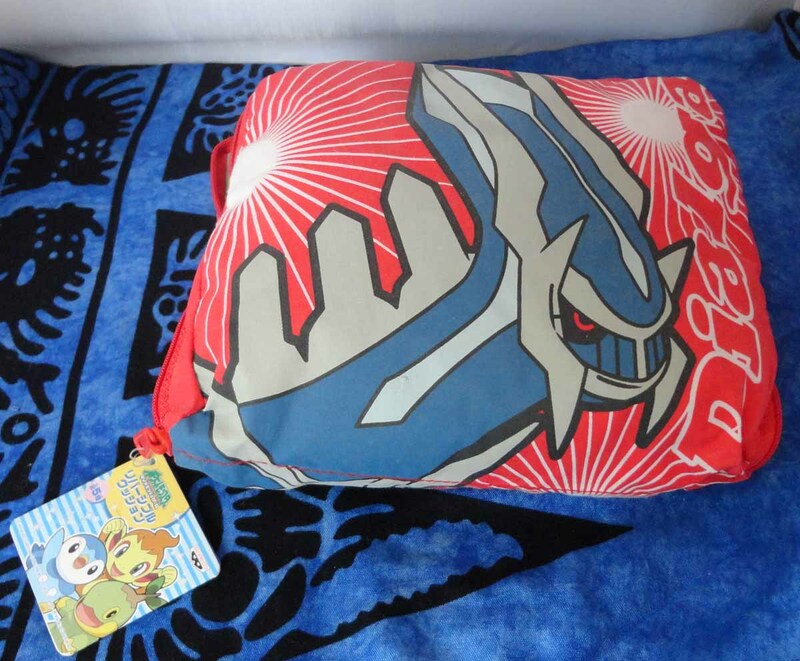 Source: Pokemon Center Tokyo and Sunyshore! These are game pencils that kids can bring to school to play when other games aren't allowed. 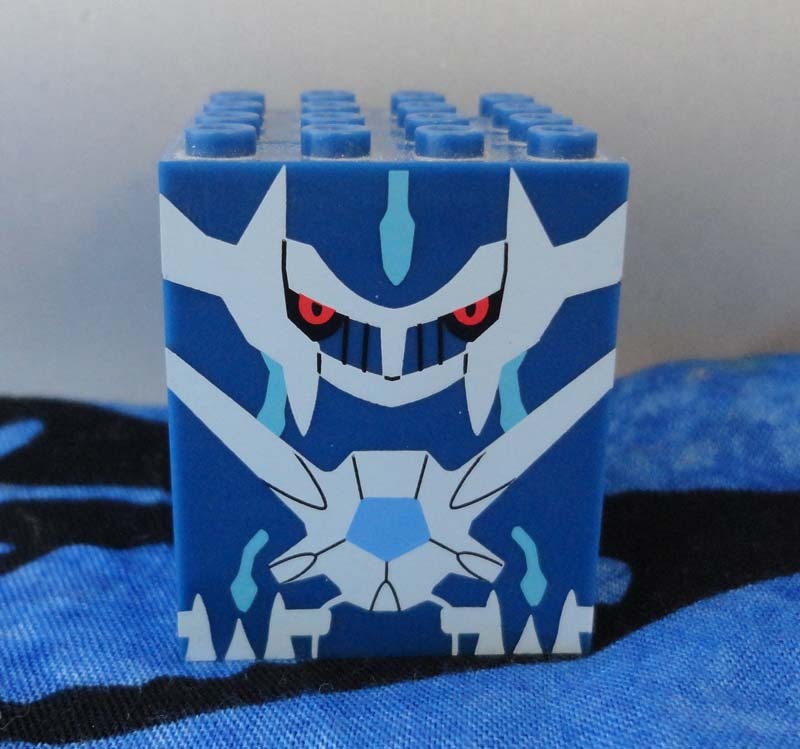 Each part of a set of 3, these feature Dialga! These are from a very large set of collectible pencils featuring awesome art. You can't really see it all that well on mine since it's hard to take pictures of all sides of a cylindrical object, but here is a picture from Nanoplasm that shows the art better. These umbrellas were so much trouble to get home from Japan. They were too long to fit in any of my suitcases or boxes (they don't fold up) so I had to have them stowed with my suitcases on both of the flights home. I'm glad that neither of them got lost in transit! 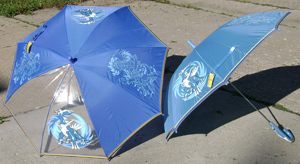 And I had to take their pictures outside because they were to big for even one of them to fit on my table ^_^ They look pretty much the same here, but there are 2 different shades of blue. This one has the same design as the cube pillow below, but zippers down the middle. 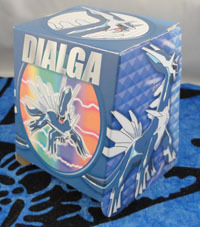 As the name suggests, you can turn it inside out for a different Dialga image. A pillow cube featuring Dialga! This pillow was sent to me from a very kind visitor to this site. Thank you! 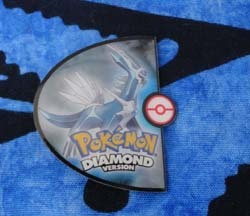 I'd long thought that this was from the 10th movie promotion, but while searching the Diamond auctions more recently I saw a copy of the game with its inserts and advertisements - including a mail-in form you could use to purchase (or claim?) these watches. 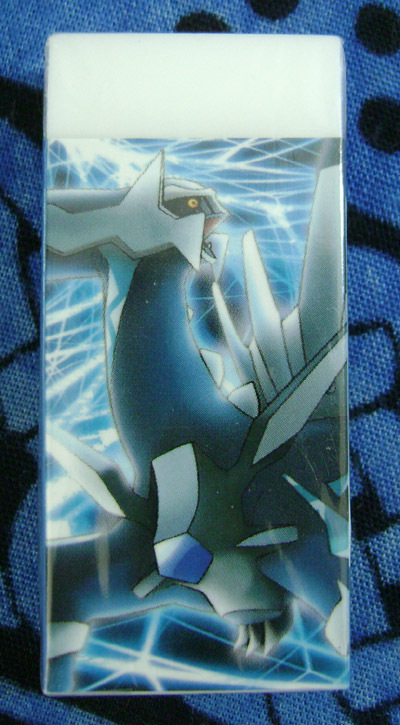 Now that I look at the case again, it pretty obviously says "Diamond" on it, not "Dialga vs Palkia vs Darkrai". Whoops, guess I wasn't paying attention! The watch itself looks to be of much better quality than I expected from the auction photos - the center is metal with a thick plastic ring around the outside, and the strap looks to be fairly sturdy. I still can't wear it unless I get an extra one, though! 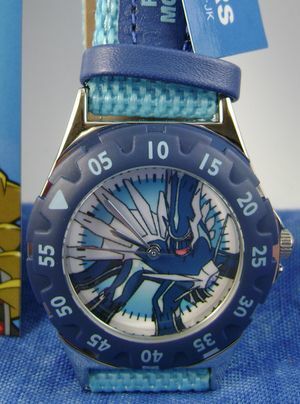 The picture was dark on the face of the watch, so here is a closeup of the watch face. 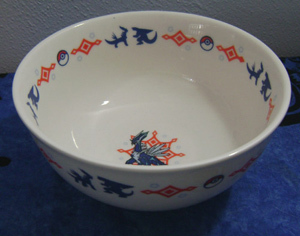 This isn't really a flat item anymore, but it was when it originally joined my collection. 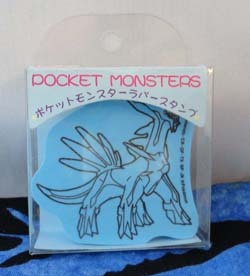 It's part of a large set of Pokemon you have to cut (or punch) out and assemble yourself. 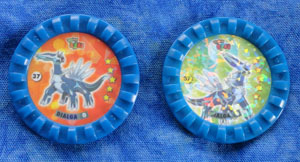 The older version on the left says 'Pokemon Pop Up Card' on the bottom, while the newer one (the 11th Movie edition) says 'Pokemon Pop Up Plate', though they're pretty clearly the same series. They both have one full image side and one side with Pokedex information. 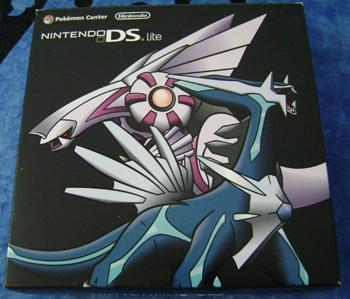 This DS was given to me by my boyfriend for my birthday before I even started collecting Dialga, because he knows I love special Pokemon edition Game Boys. I have not used it, so it's been kept neat and clean in the original box. 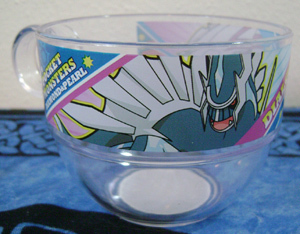 Maybe he will use it if we get to go to another Pokemon con someday!